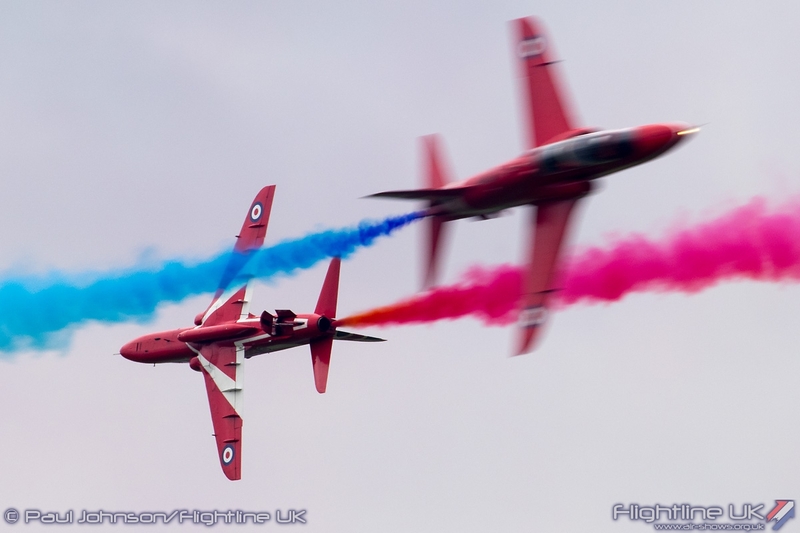 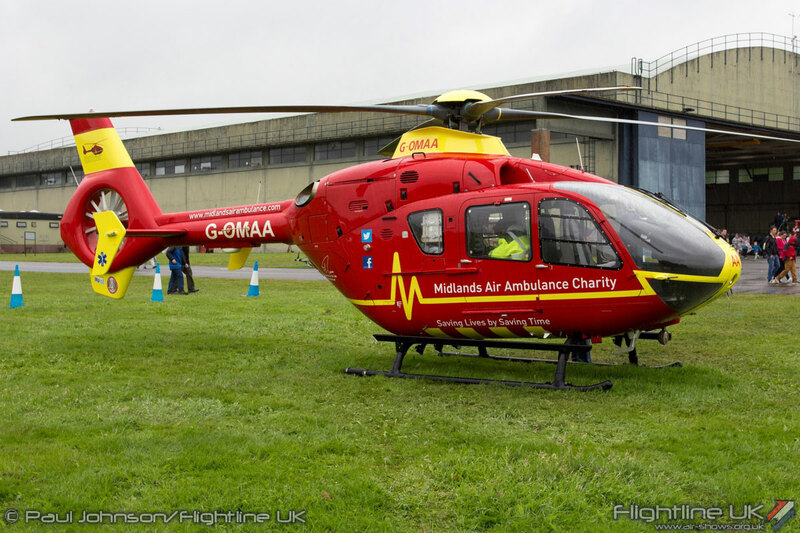 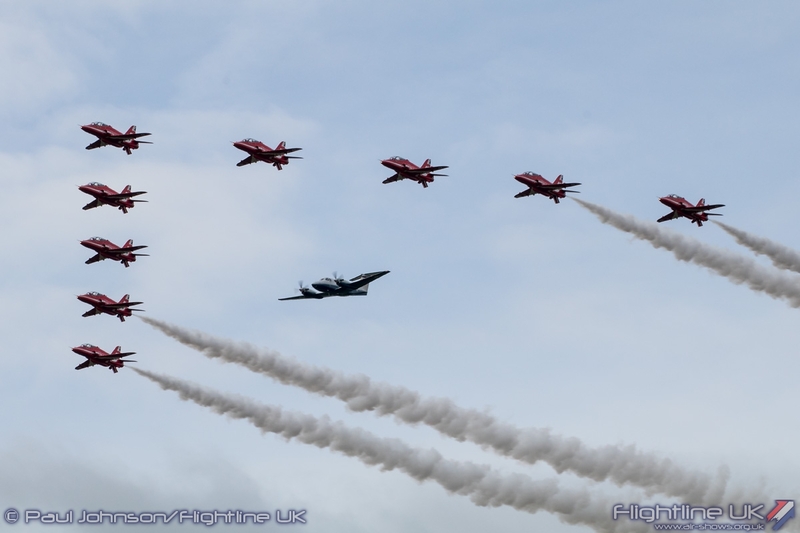 2016 again saw RAF Cosford host the only Royal Air Force airshow of the year and the biggest such event in the West Midlands. 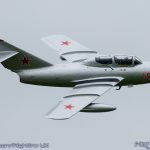 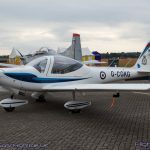 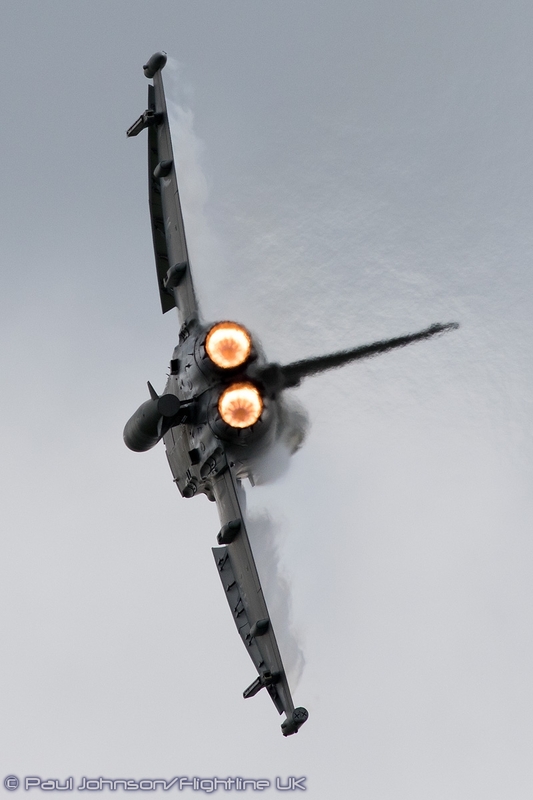 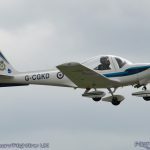 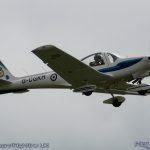 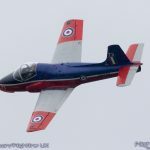 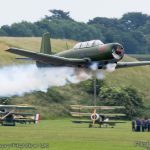 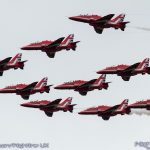 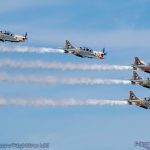 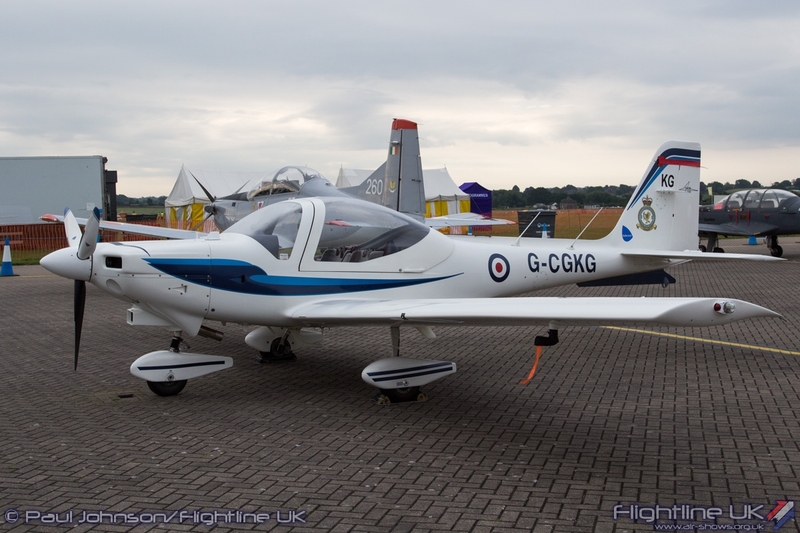 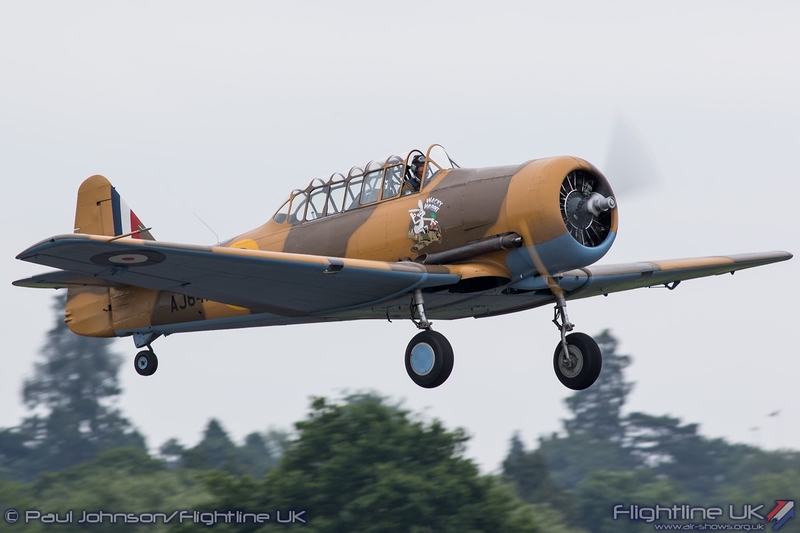 This year the show followed three major themes celebrating the 75th Anniversary of the Air Cadets, Training and the evolution of the jet engine. 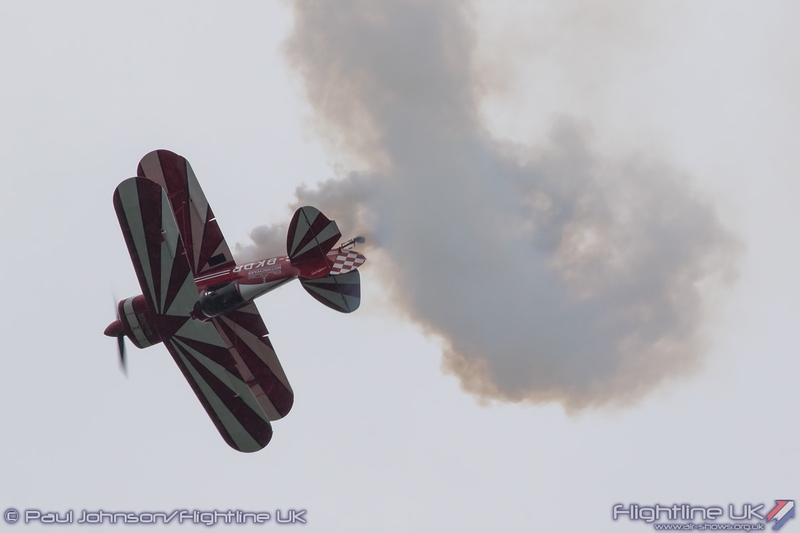 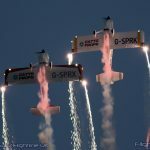 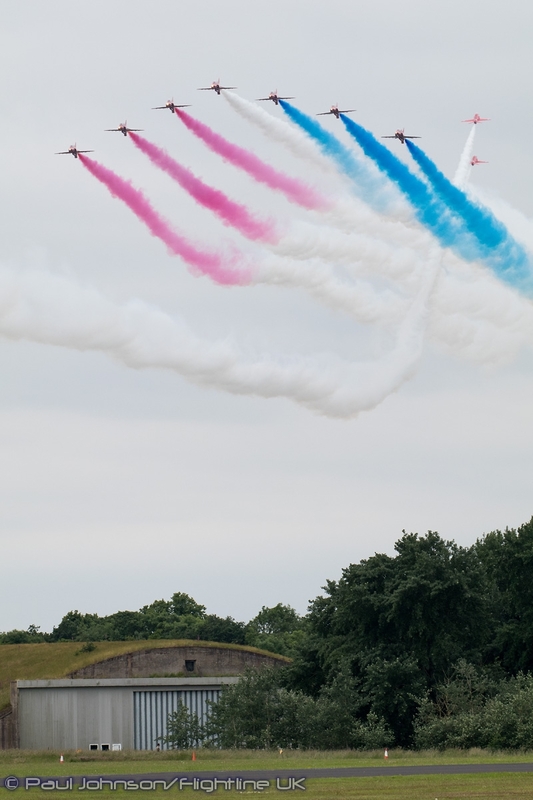 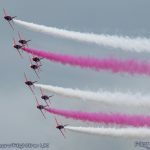 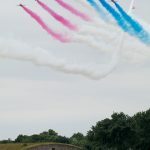 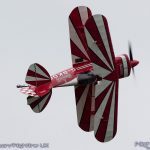 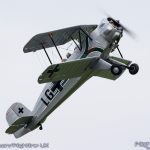 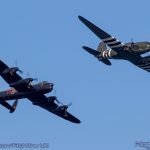 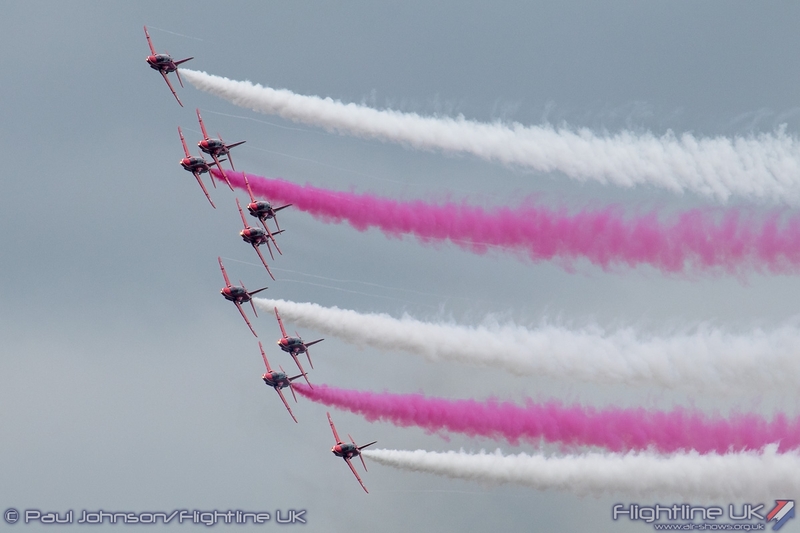 In celebrating these three themes, the team behind the airshow put together an eclectic and very different flying display programme supported by static aircraft displays and the exhibition hangars. 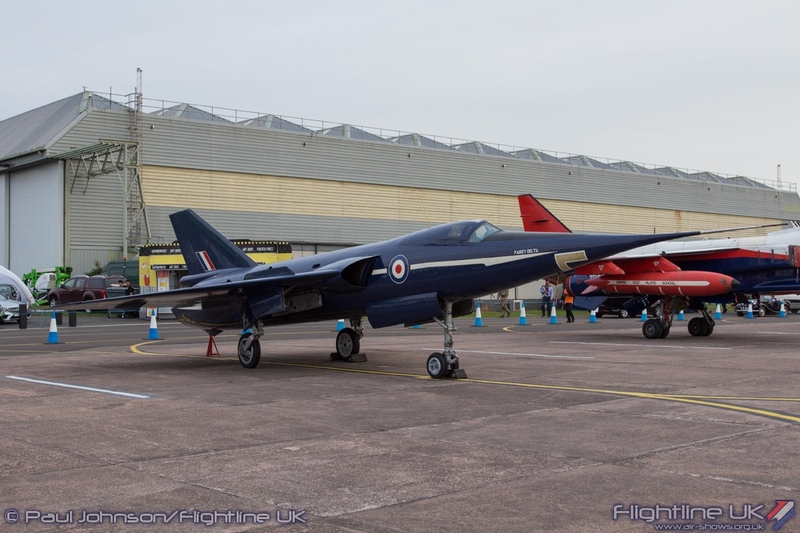 2015 was a very good year for Cosford. 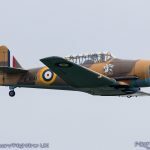 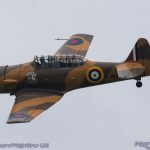 Not only did it celebrate the 70th Anniversary of VE Day in some style, it attracted significant participation from European air arms despite some unfortunate last minute cancellations. 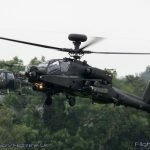 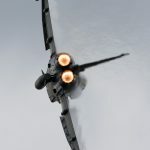 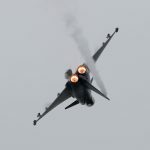 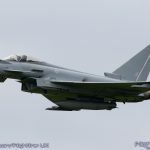 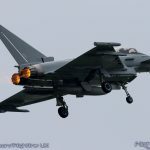 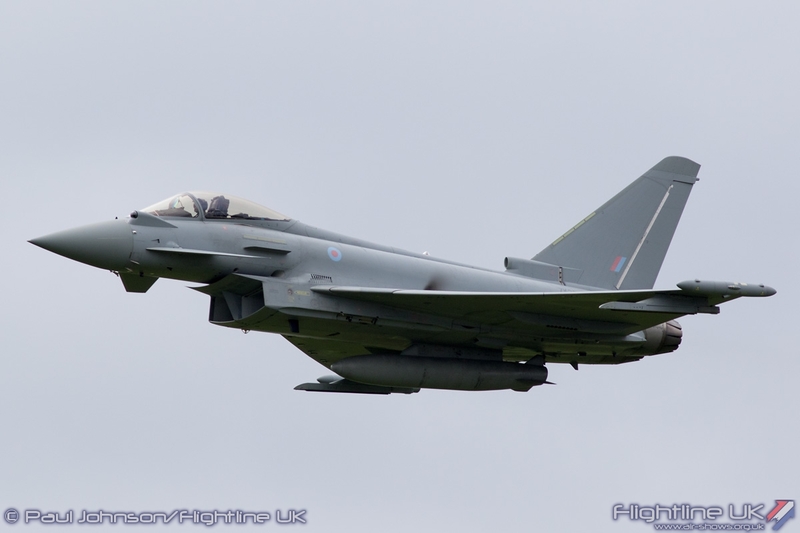 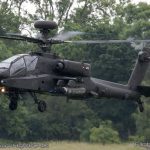 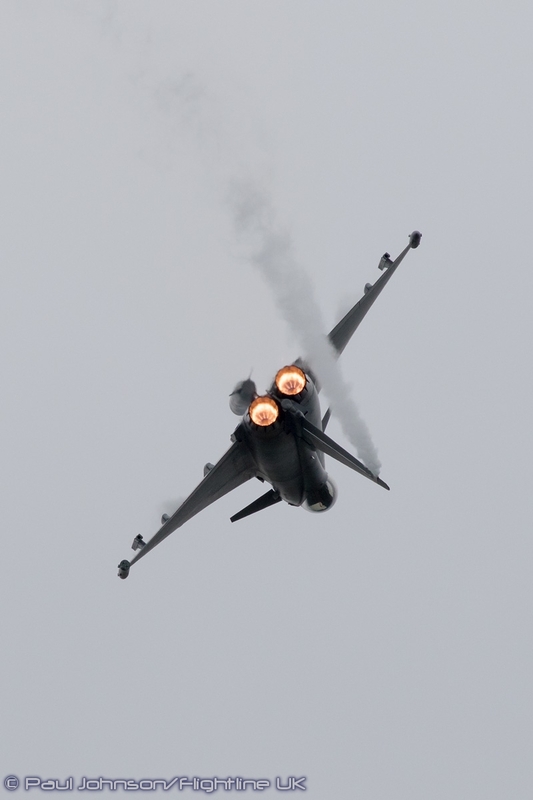 2016 proved to be somewhat more challenging, not least because the array of displays from the Royal Air Force had reduced significantly and 2016 saw many more military displays across Europe. 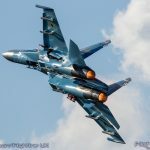 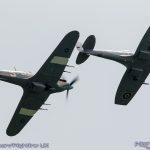 Having said that, the selection of aircraft planned was still very good considering the themes and many of the other challenges the show faced this year. 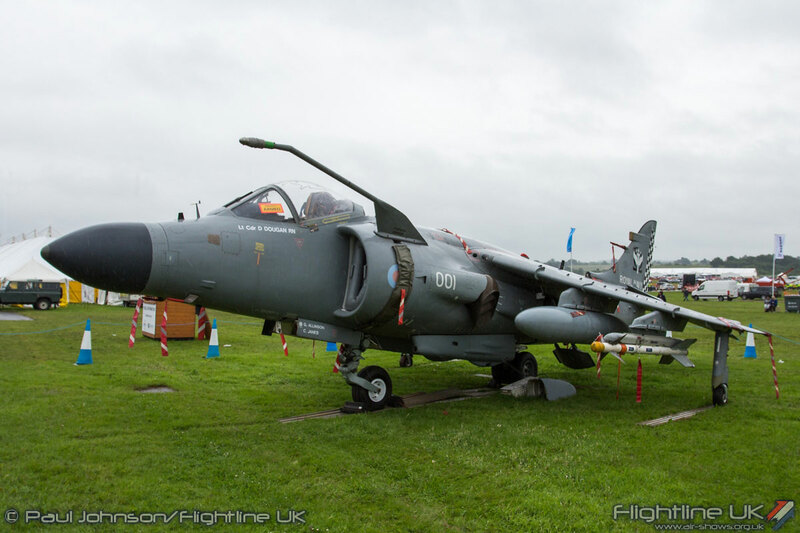 Cosford has one major advantage over many other airshow venues with the wonderful RAF Museum on site. 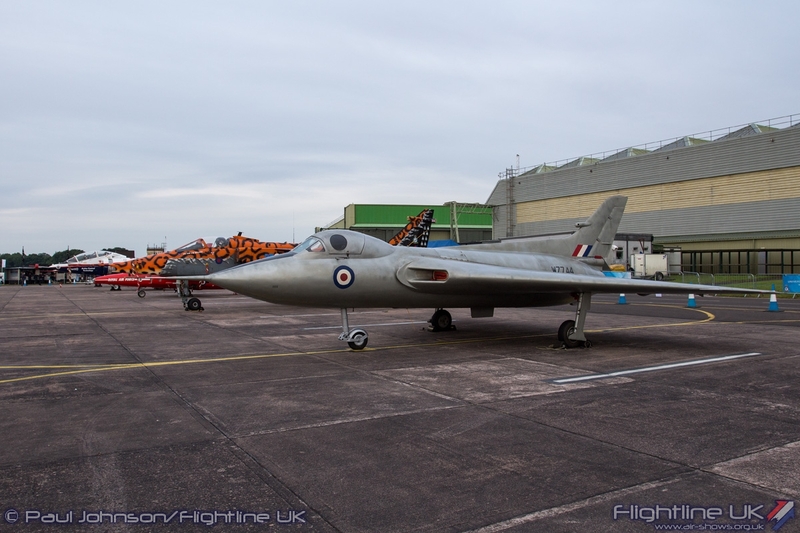 For the ‘Speed’ theme, this meant that Cosford could really present an unparalleled range of aircraft on static display to highlight the development of jet aircraft. 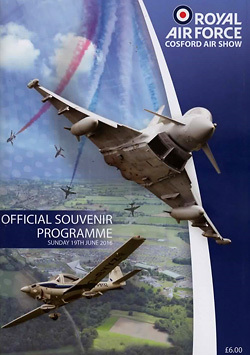 2016 not only marks the 75th Anniversary of the first flight by a Jet aircraft, the Gloster E28/29 but also the 20th Anniversary of Sir Frank Whittle’s death. 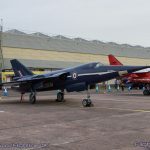 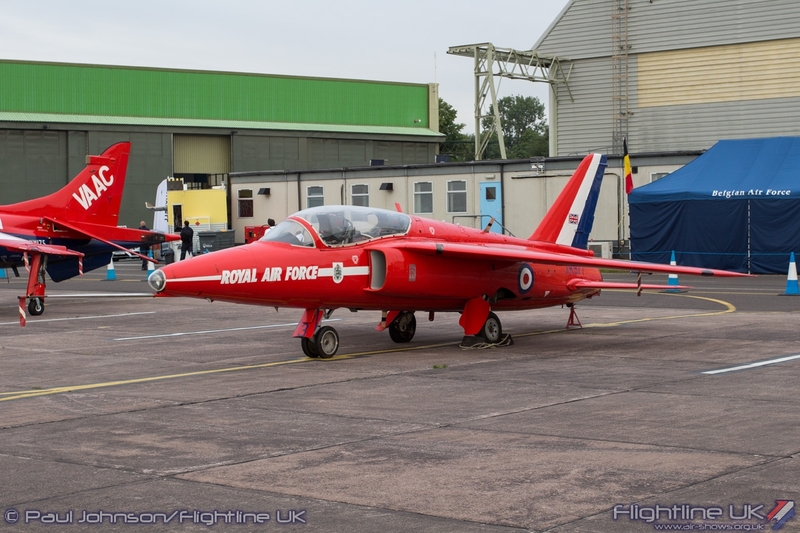 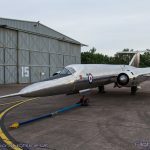 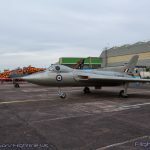 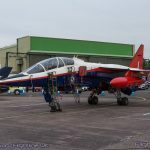 The Cosford branch of the RAF Museum hosts the Experiment and Test aircraft collection and specifically for the show, the Museum’s Avro 707, Bristol 188, Folland Gnat T1 and Fairey Delta II were brought outside to join the static display. 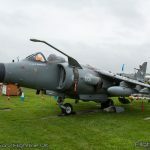 Joining them was the Airshow’s own BAE Harrier GR3 which for 2016 had been repainted in Artic operations camouflage plus a BAE Systems Sea Harrier FA2 on loan from RNAS Yeovilton. 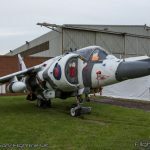 Also making a welcome return appearance outside was the BAE Harrier T4 from the VAAC project that was used to test many of the systems on the new F-15B Lightning II. 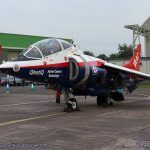 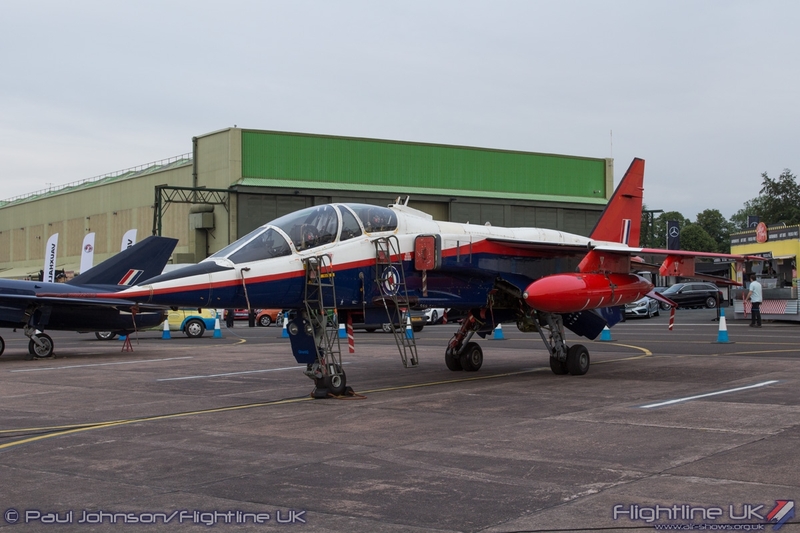 The based No 1 School of Technical Training is home to a number of SEPECAT Jaguar GR1/3 aircraft and many of these joined the static displays of jet aircraft and also helped mark the 25th Anniversary of Operation Granby. 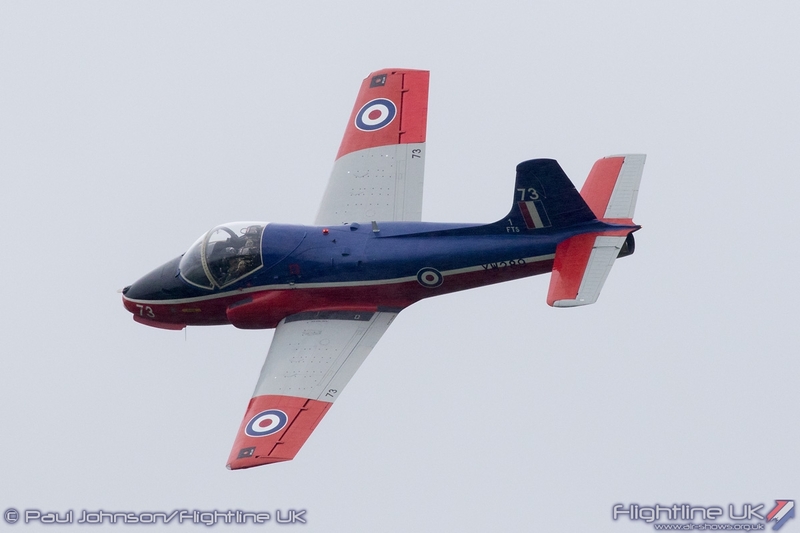 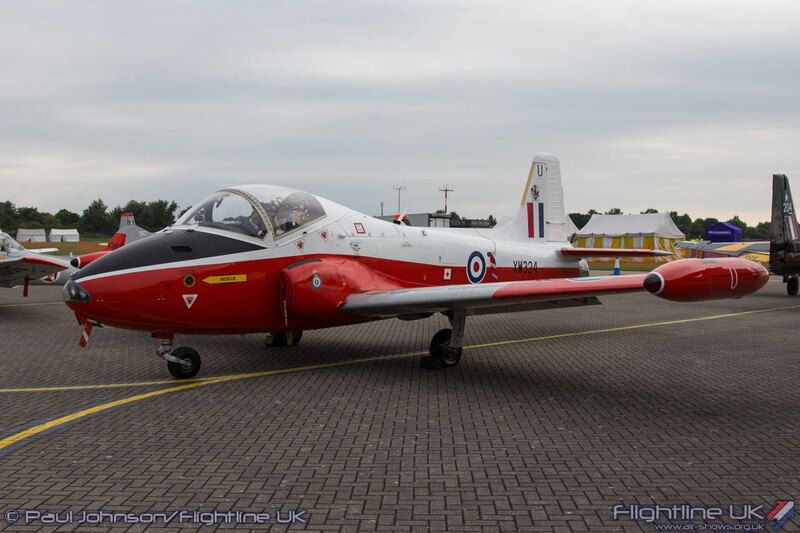 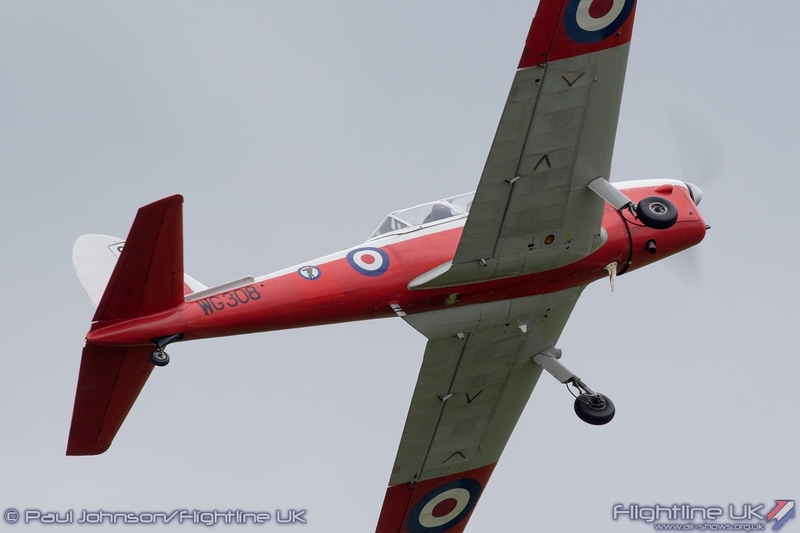 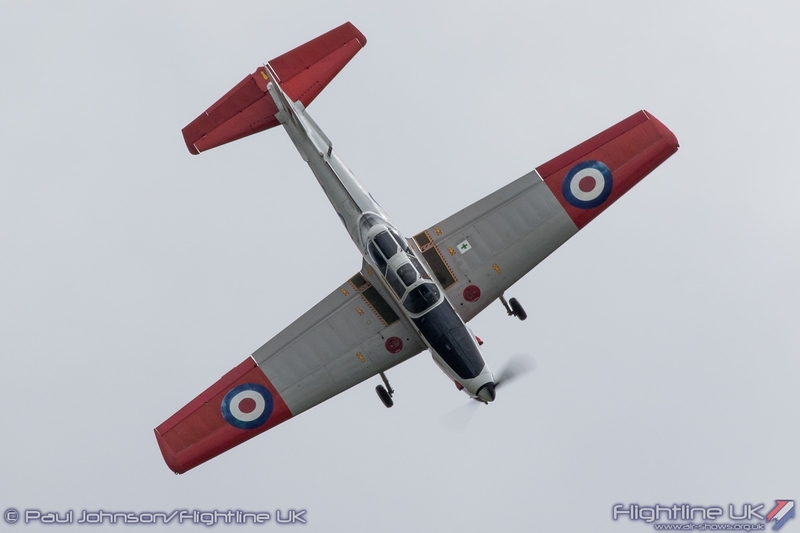 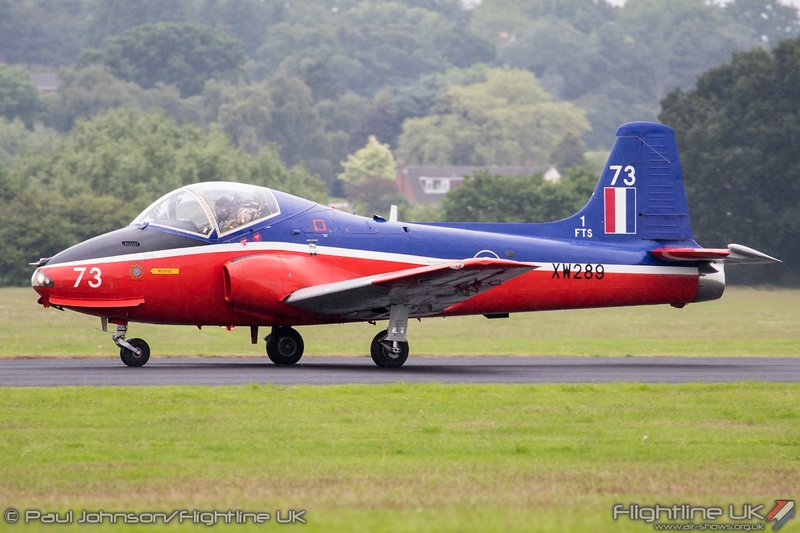 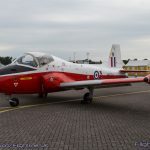 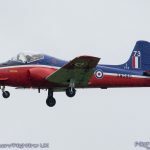 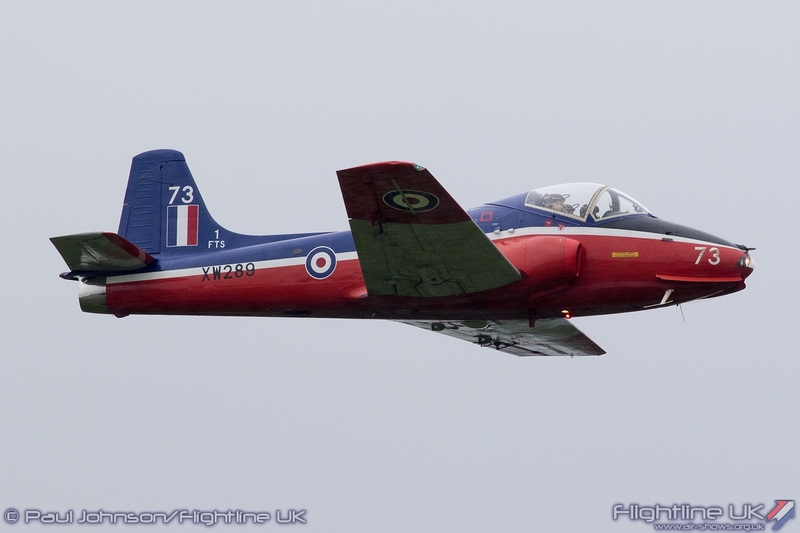 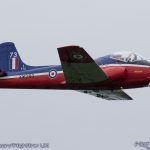 Providing some crossover between the Jet and Training theme was Jeff Bell’s immaculate BAC Jet Provost T5 XW384 wearing the typical Red, White and Grey RAF training scheme. 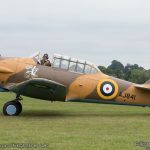 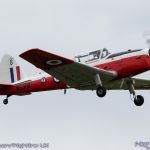 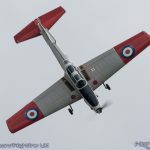 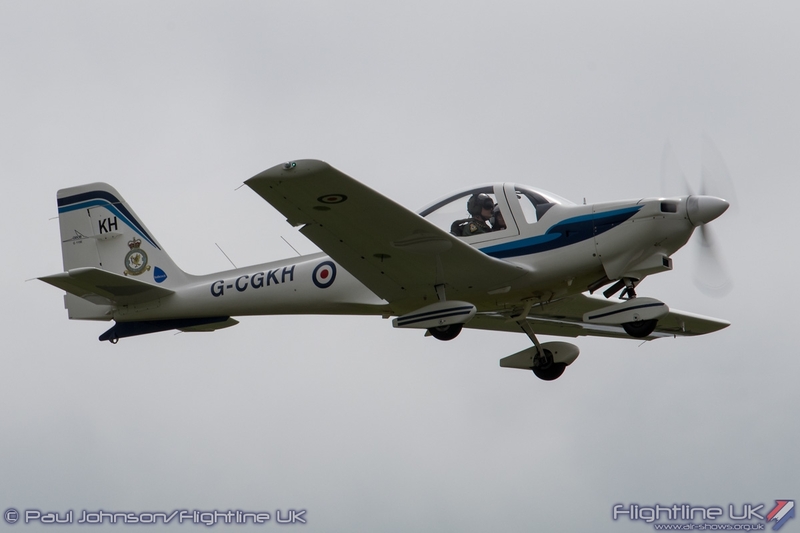 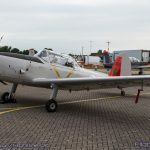 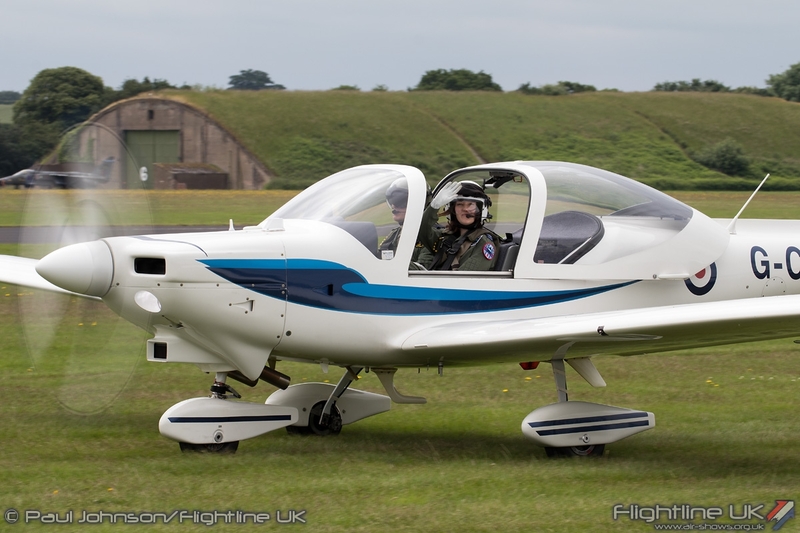 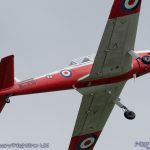 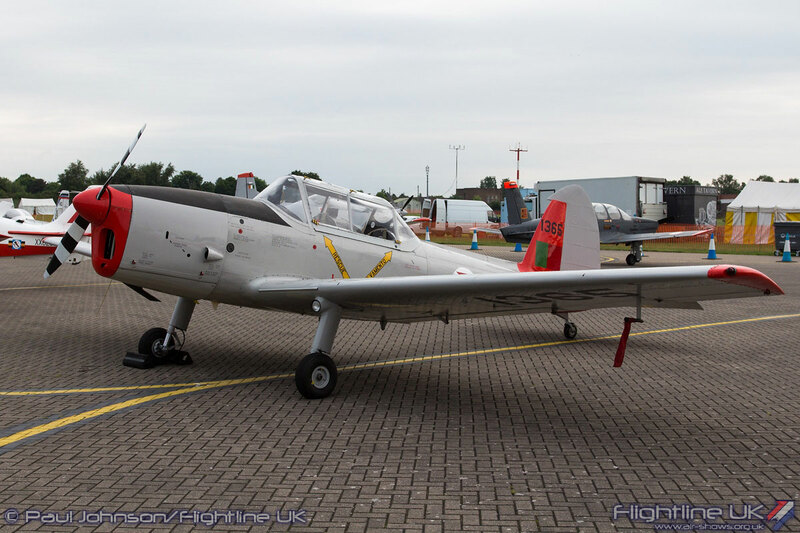 The training and Air Cadet 75 themes also saw an impressive gathering of de Havilland Chipmunk T10s, Scottish Aviation Bulldog T1s and a Slingsby Venture T61. 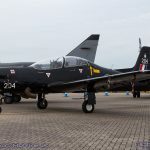 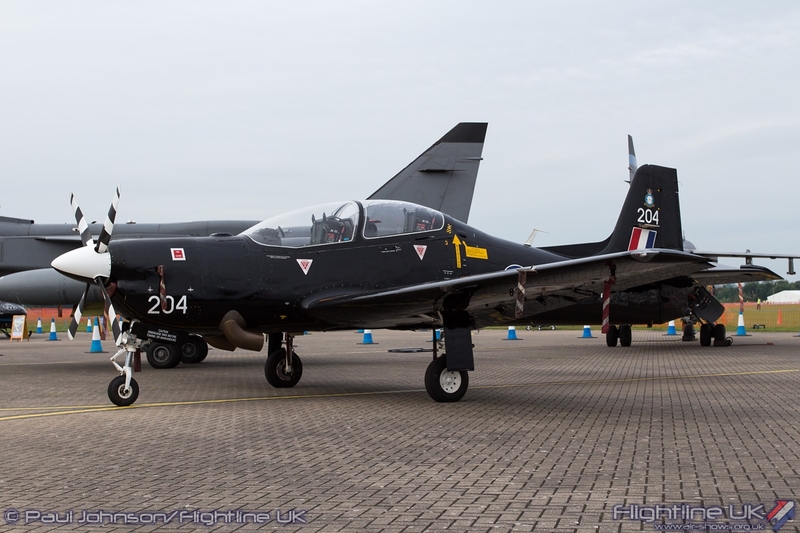 The modern day Royal Air Force training fleet was represented by a Shorts Tucano T1 from No 72[R] Squadron plus an Airbus Helicopters Squirrel HT1 from Defence Helicopter Flying School. 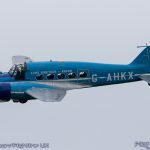 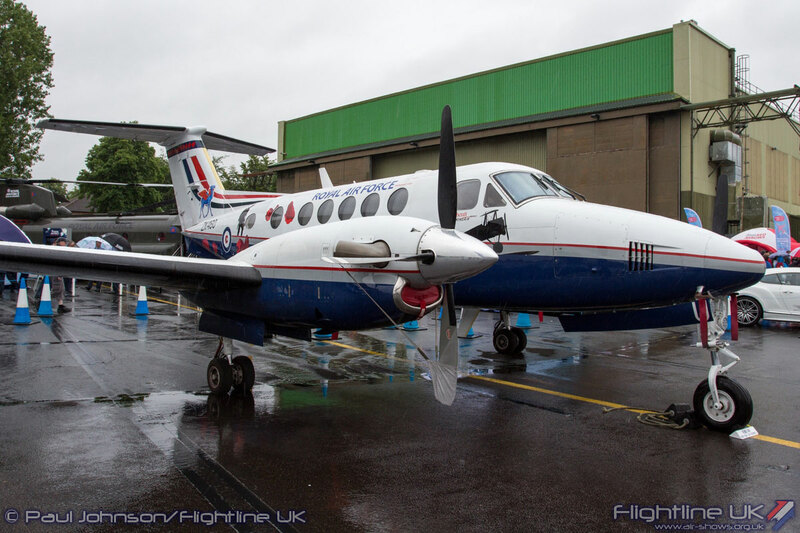 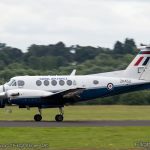 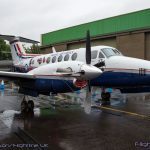 Two further RAF aircraft on static display were wearing centenary anniversary markings, a Bell Griffin HT1 from 60[R] Squadron at RAF Shawbury and a Beechcraft King Air B200 from 45[R] Squadron at RAFC Cranwell. 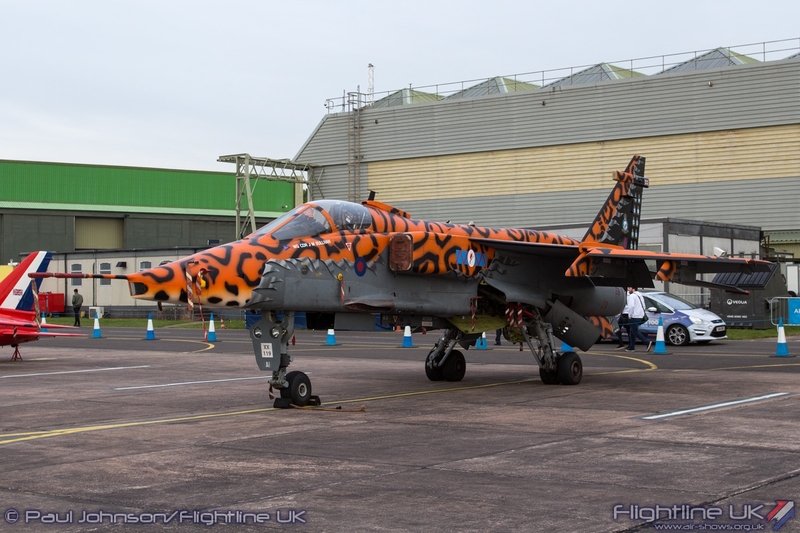 Adding further colour to the training theme were some international visitors. 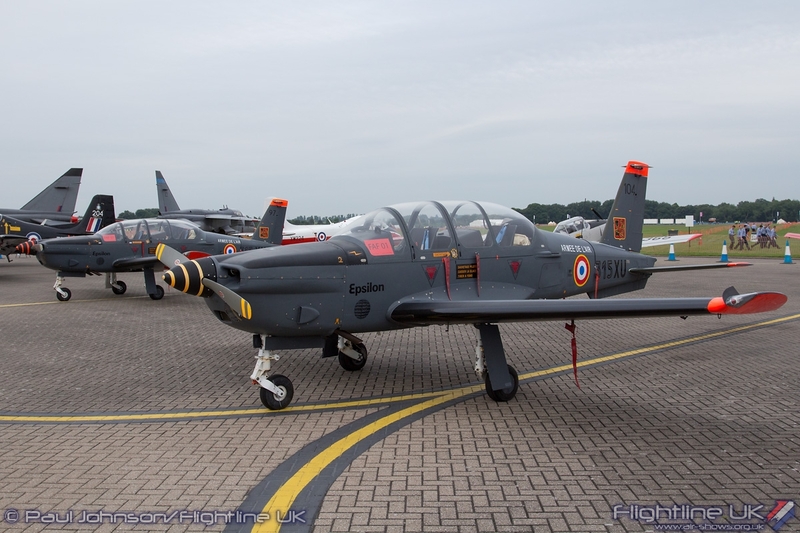 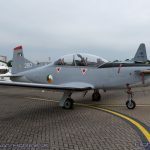 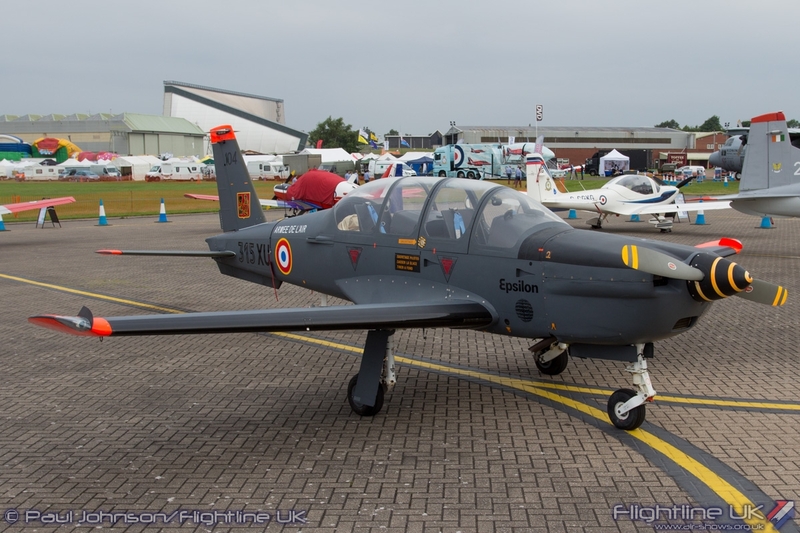 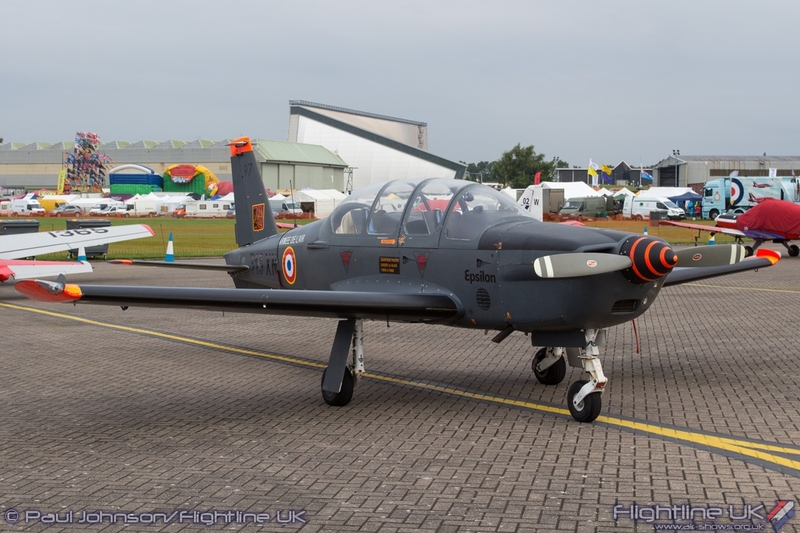 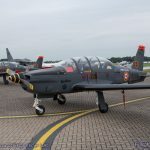 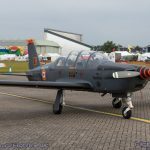 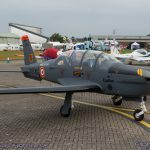 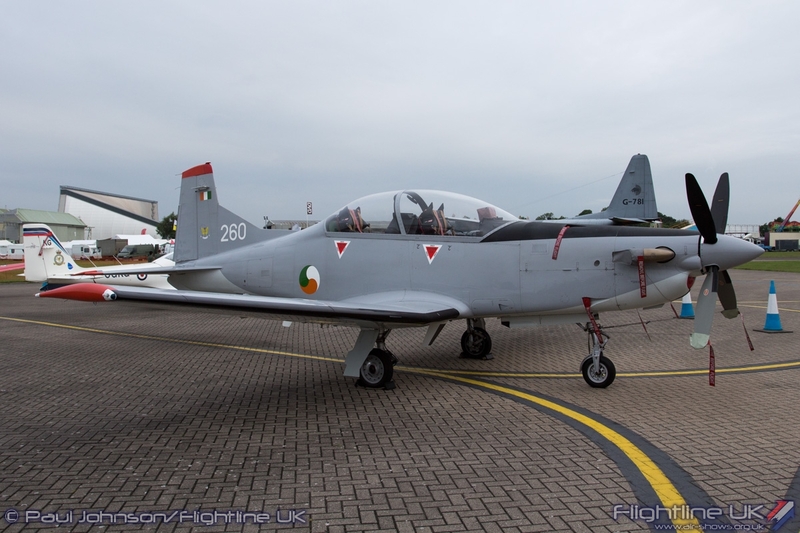 The French Air Force made a rare contribution with a pair of SOCATA TB30 Elipsons while the Irish Air Corps contributed a Pilatus PC-9M. 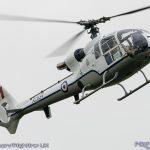 Classic helicopters are becoming more popular and Cosford celebrate this with a “whirlybirds” area near the Control Tower. 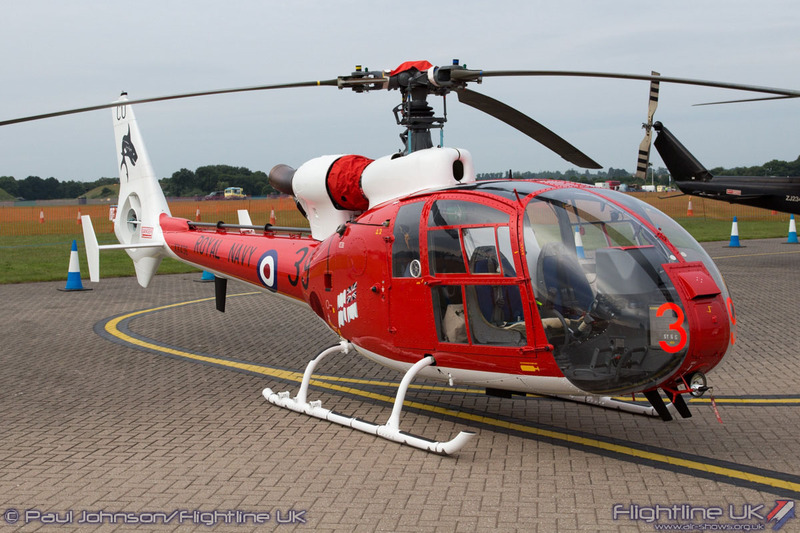 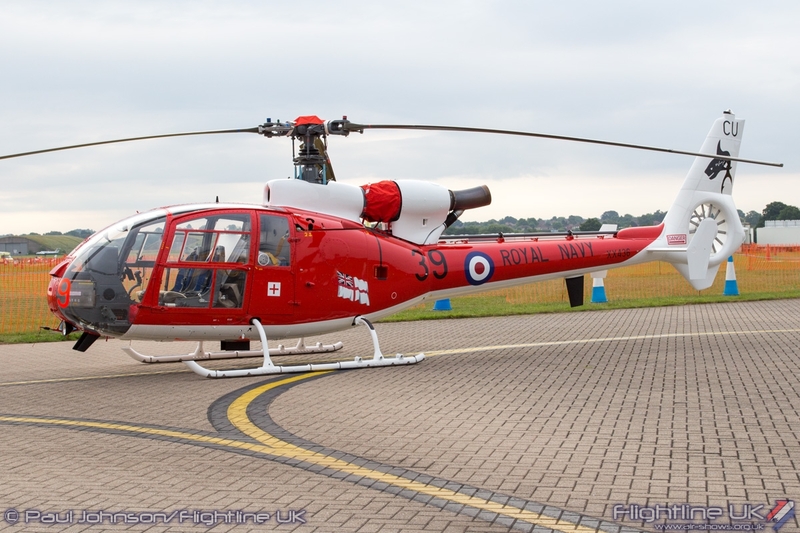 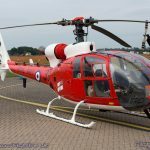 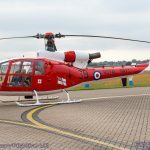 One of the largest operators is the Gazelle Squadron which as well as contributing to the flying display also had their new Gazelle HT3 on static display. 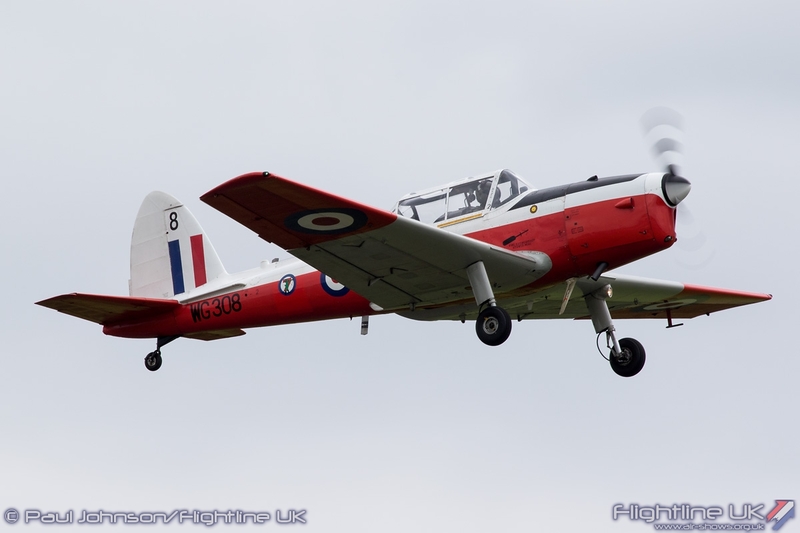 Terry Martin also appeared with his Westland Wasp HAS1. 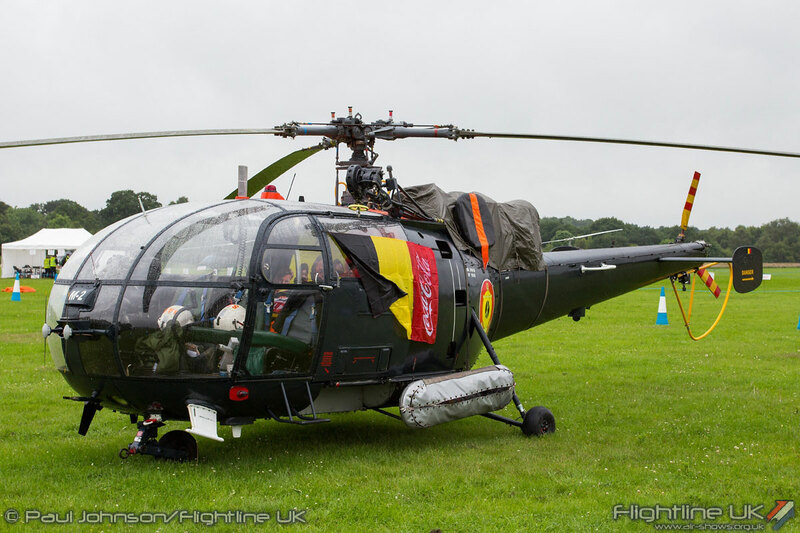 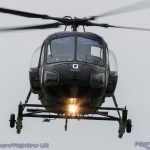 However, star of the “classic’ helicopter line-up was the Sud-Aviation Alouette III from the Belgian Navy. 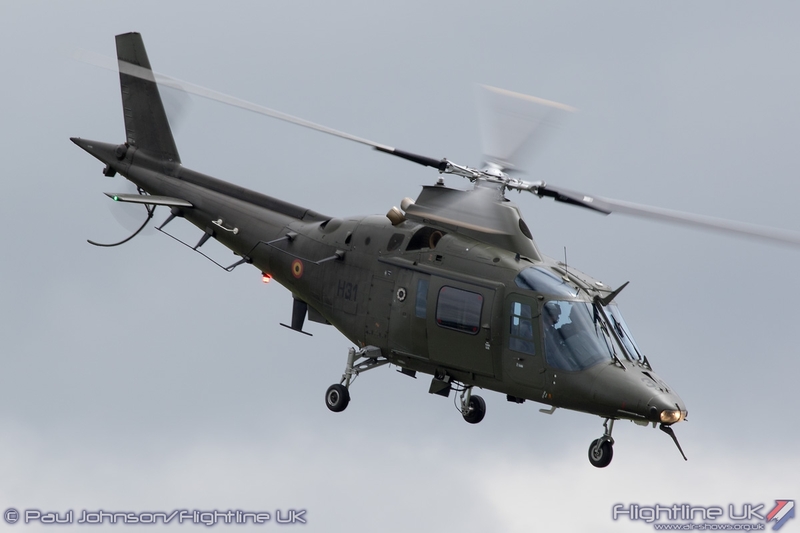 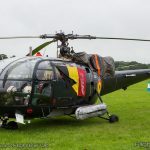 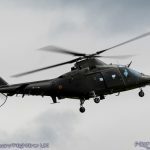 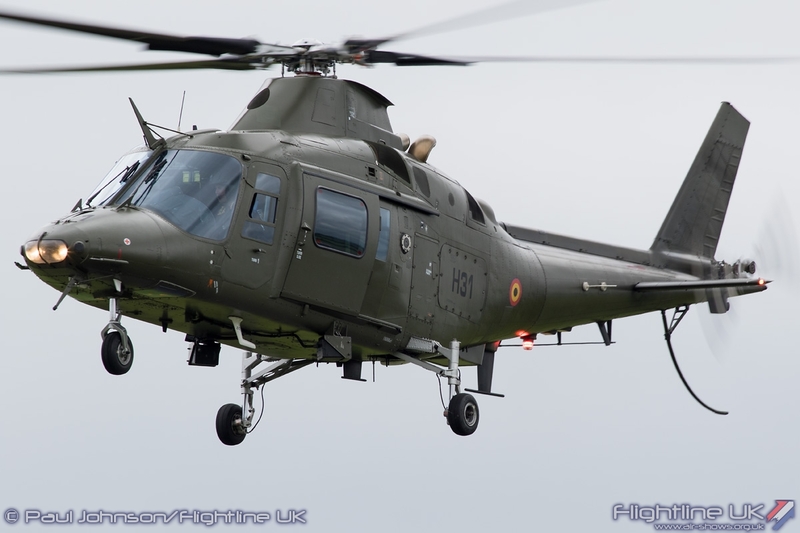 Only a handful of these helicopters remain in service with the Belgian military and make very few public appearances outside their home country. 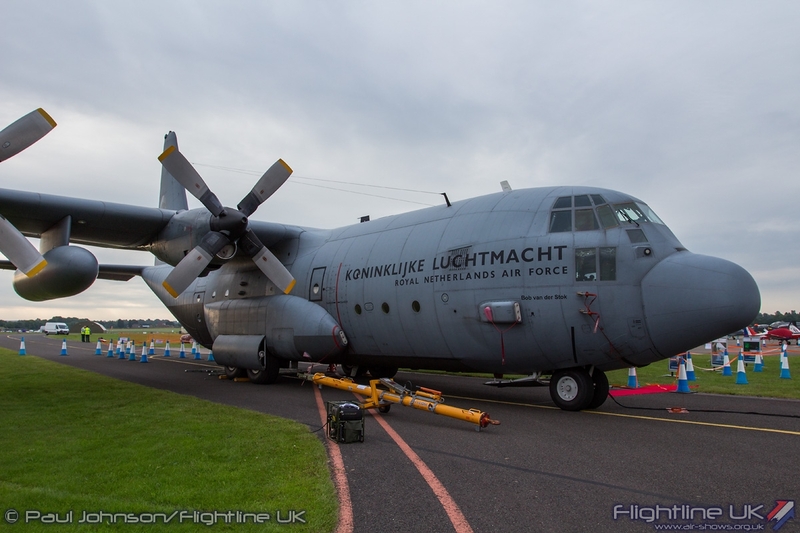 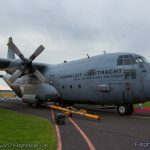 Standing tall above the rest of the static displays was a Lockheed C-130H Hercules from the Royal Netherlands Air Force making a rare UK airshow appearance and proved popular as a walk-through attraction particularly as the rain closed in. 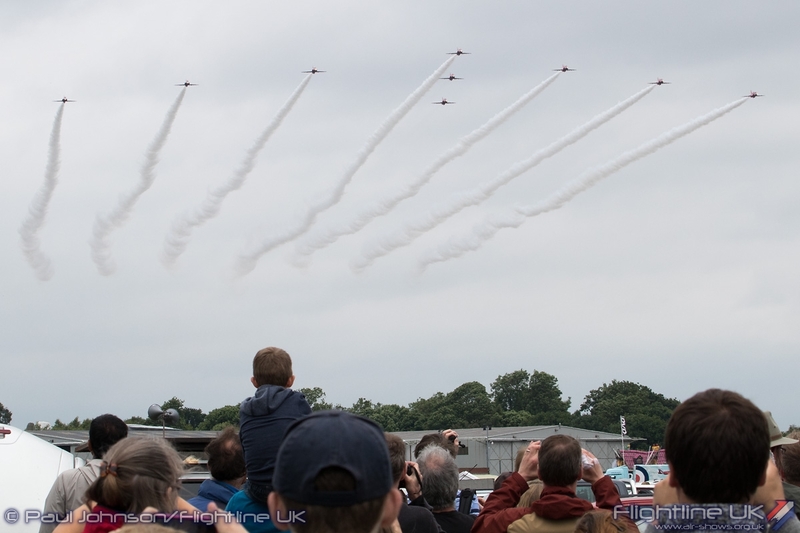 The content and pace of the flying display was sadly a factor outside of the airshow organisers control with a warm front rapidly encroaching from the west. 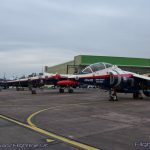 This turned the afternoon in to a huge juggling act for Flying Display Director Mike Stanway as he had to accommodate cancelling display acts stuck on the wrong side of the weather, making sure the right acts were available for when the weather did finally hit Cosford and also making sure those that needed to head home during the day could do so. 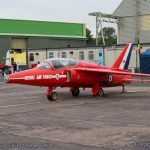 It was a disappointment to all concerned that the likes of the Hangar 11 P-51D, Gnat Display Team and Sea Vixen were all unable to attend due to low cloud between their operating bases and Cosford. 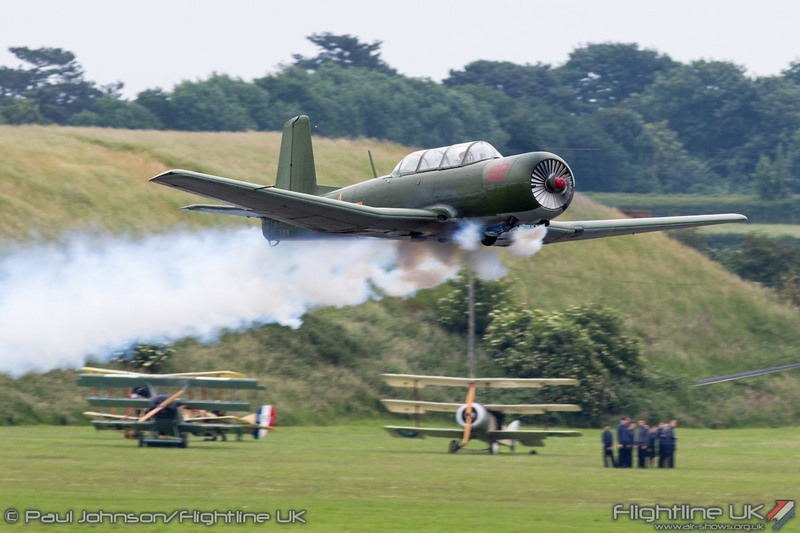 For the start of the flying display, the weather was fairly good with a reasonable cloud base. 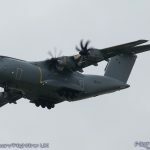 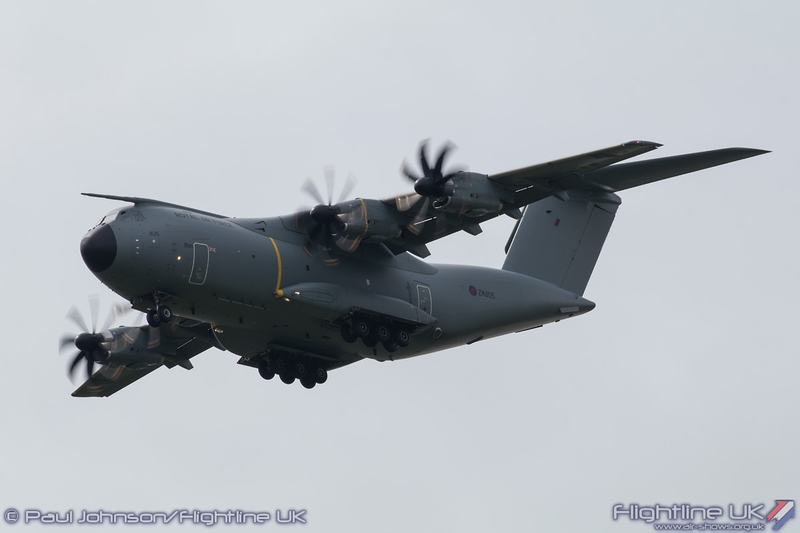 To kick things off in the air the RAF showed off its latest transporter, the Airbus A400M Atlas C1 from 70 Squadron at RAF Brize Norton. 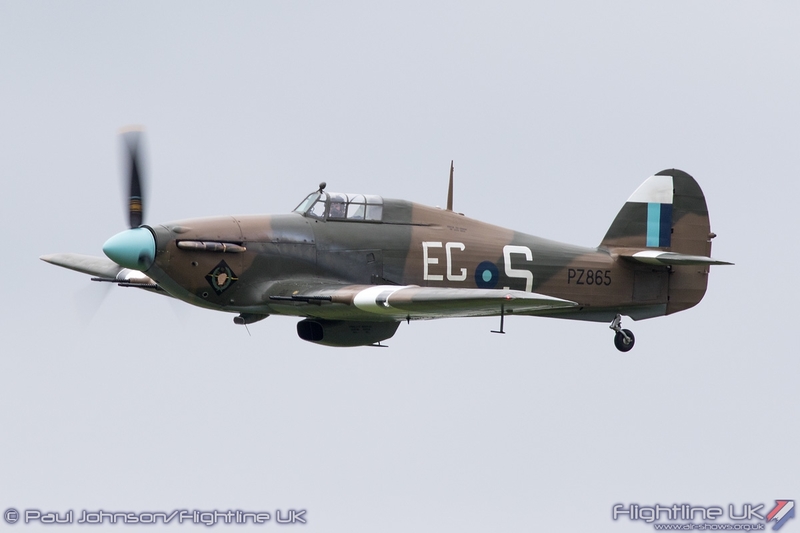 If was flown by Flt Lt Tim Dunlop, better known as one of the multi-engine pilots for the Battle of Britain Memorial Flight. 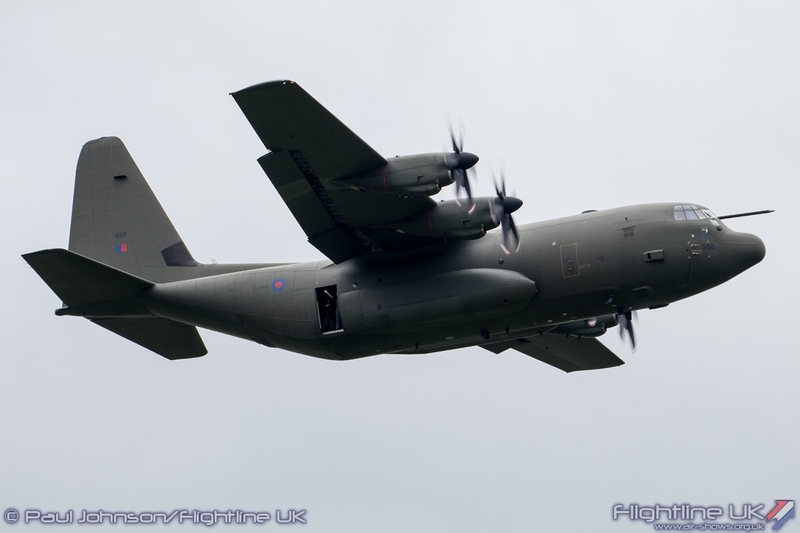 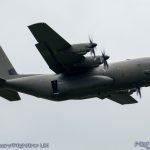 Later in the afternoon, another Brize Norton based aircraft also made a slow and low flypast, this time a Lockheed C-130J Hercules C5 from 47 Squadron. 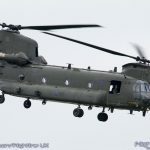 While both appearances were quite brief, it was good to see the RAF’s bust transport fleet make some airshow appearances. 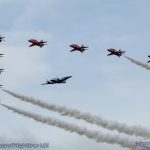 Sadly the other Brize Norton display, the RAF Falcons Parachute Display Team were forced to cancel as the cloud-base was just below their minima. 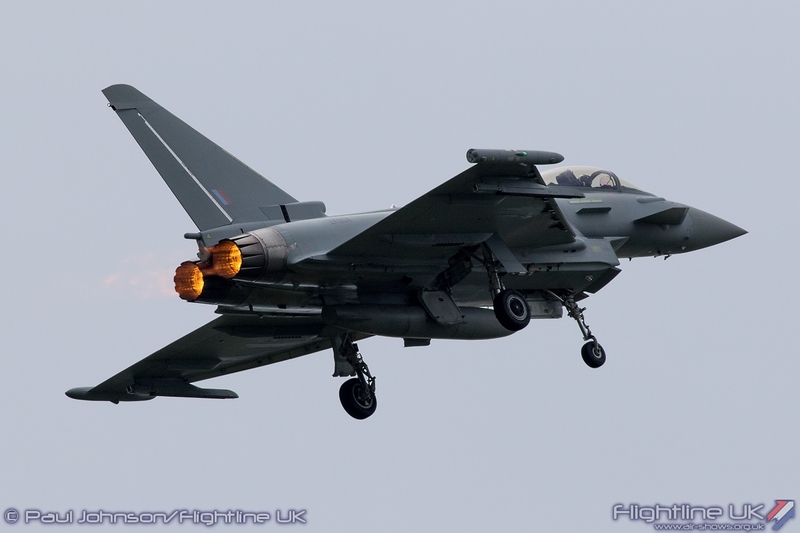 Hot on the heels of the Atlas was another very special moment for the Royal Air Force. 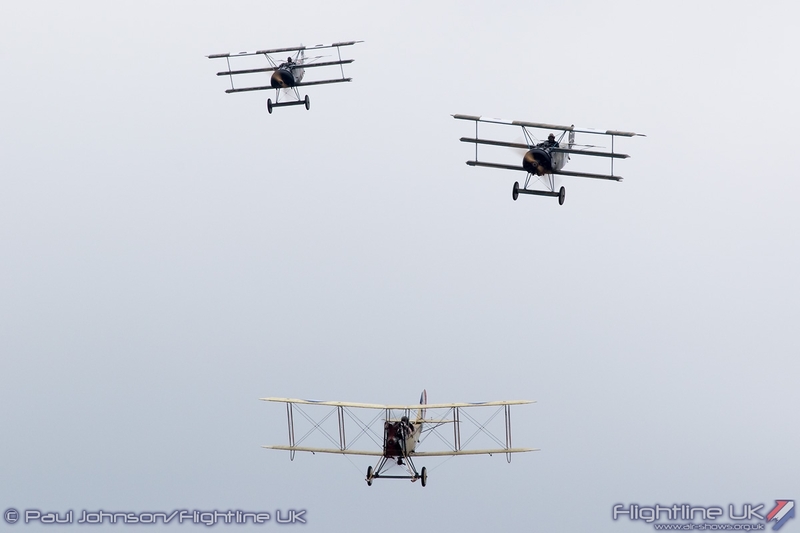 2016 sees many famous RAF squadrons celebrate their centenary. 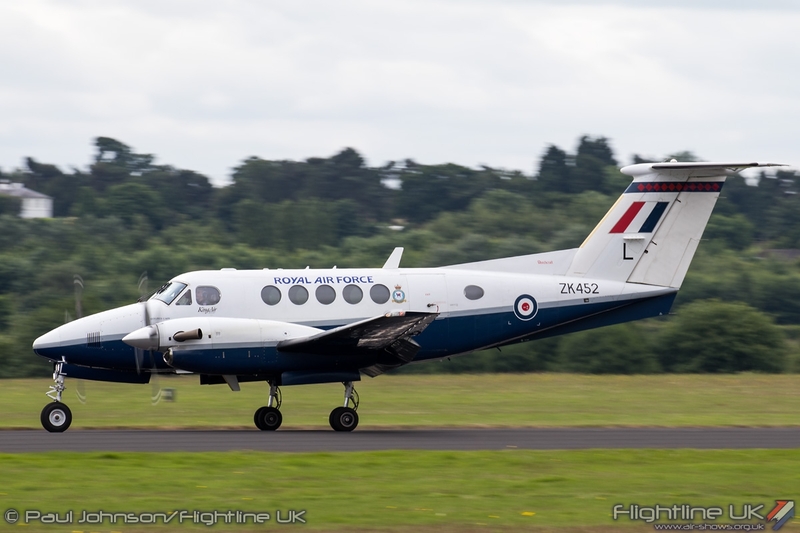 Amongst them are 45[R] Squadron based at RAFC Cranwell currently training future multi-engined pilots on the Beechcraft King Air B200. 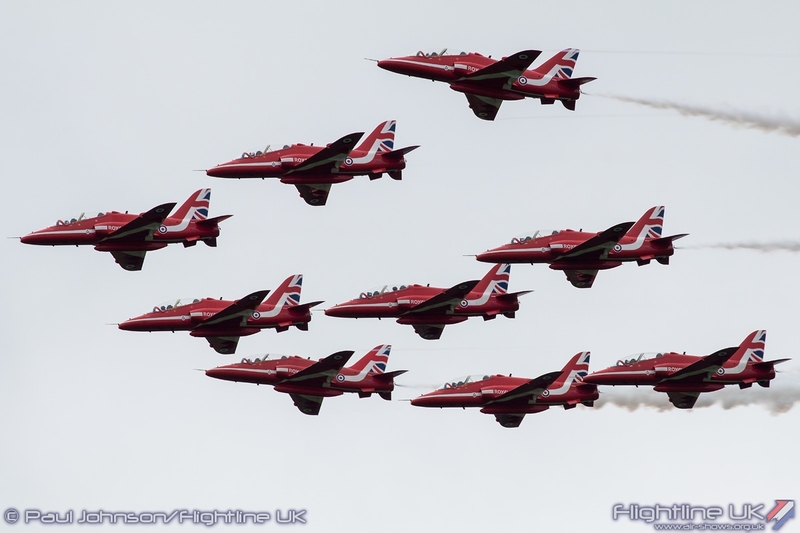 To celebrate their anniversary, the Squadron has the honour of opening the main flying display flying in formation with the Red Arrows. 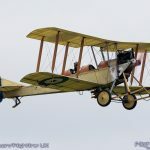 The formation also fitted in well with the training theme plus two sub-themes to the day, the 25th Anniversary of Operation Granby (the first Gulf War in 1991) and the 100th Anniversary of the Battle of the Somme. 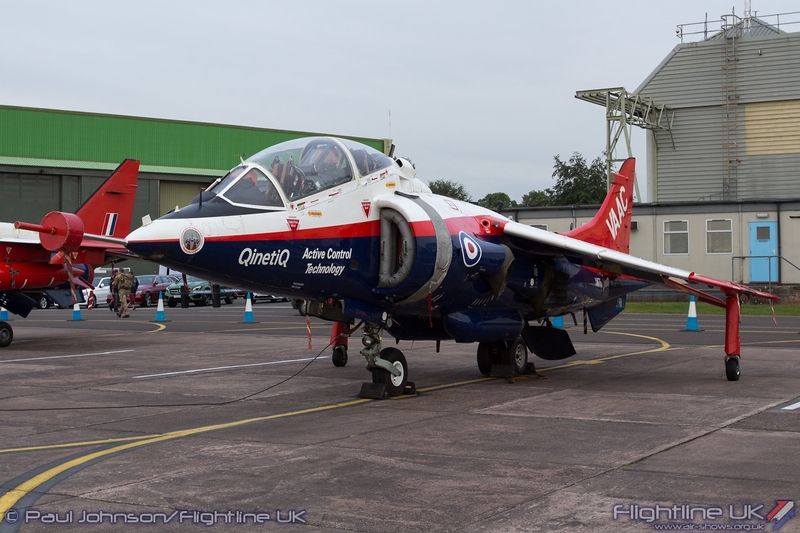 45[R] Squadron’s colours include both as Battle honours. 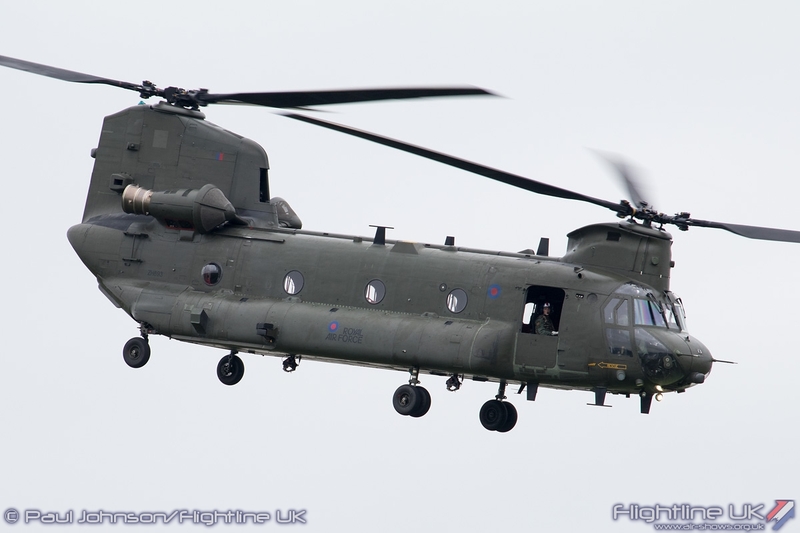 Naturally it was the Royal Air Force at the fore for much of the afternoon. 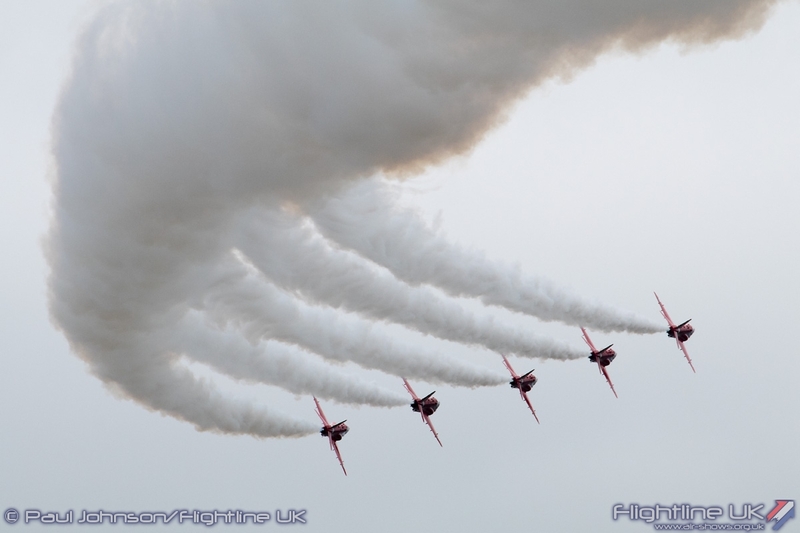 The Red Arrows returned mid-afternoon to display under the overcast. 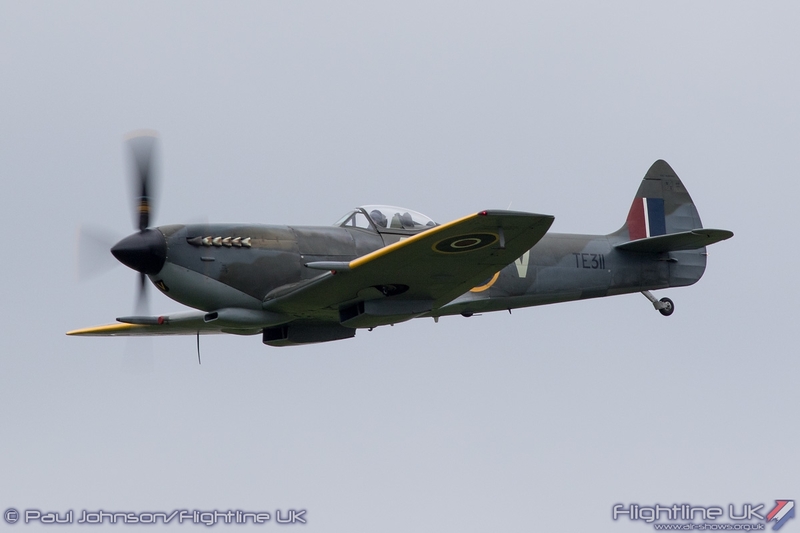 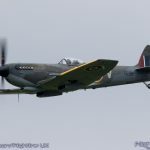 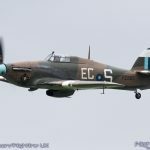 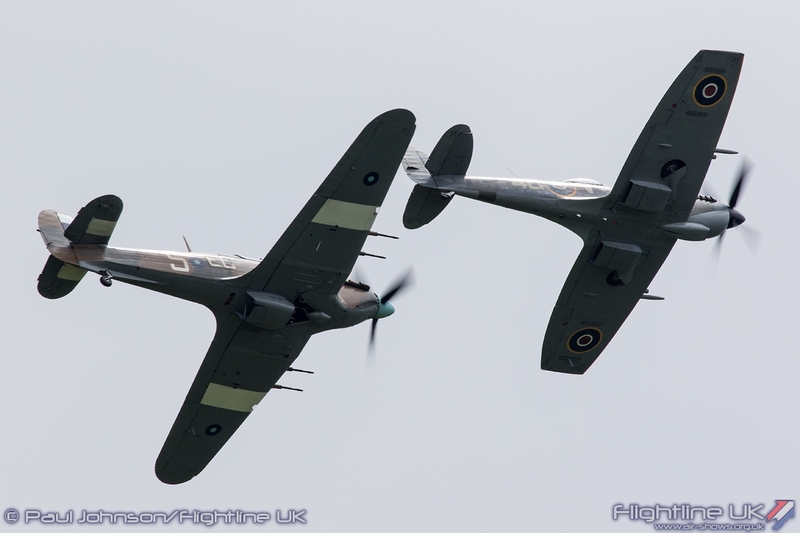 The other main display teams also appeared with thepair of Supermarine Spitfire XVI TE311 and Hawker Hurricane IIc PZ865 from the Battle of Britain Memorial Flight and of course the impressive Eurofighter Typhoon FGR4 solo display from Flt Lt Mark Long. 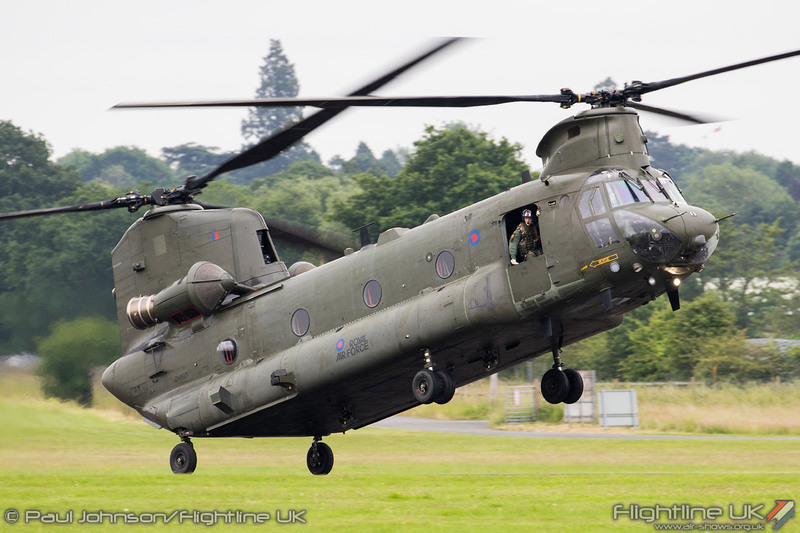 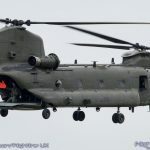 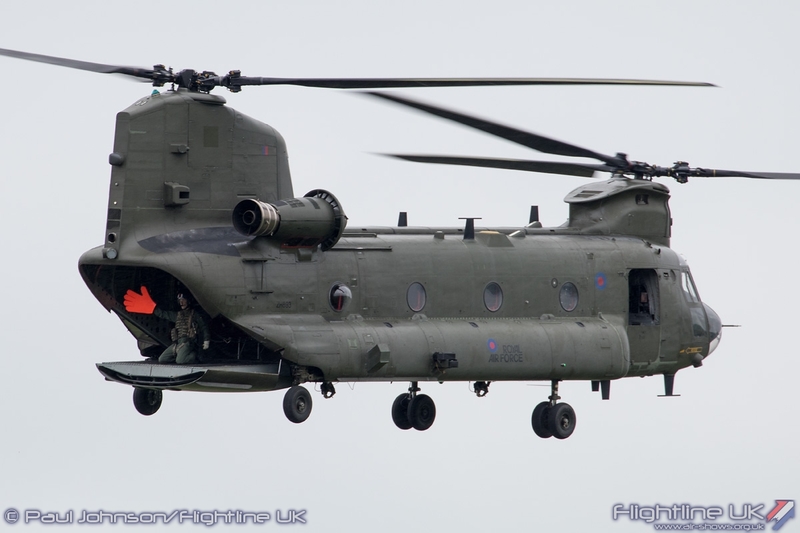 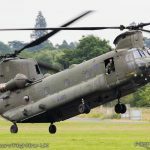 The RAF Boeing Chinook HC4 display also appeared for its first UK display of 2016 in the hands of display captain Flt Lt Luke Huntley. 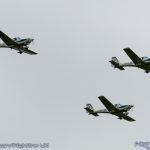 The 75th Anniversary of the Air Cadets was also marked in the flying display. 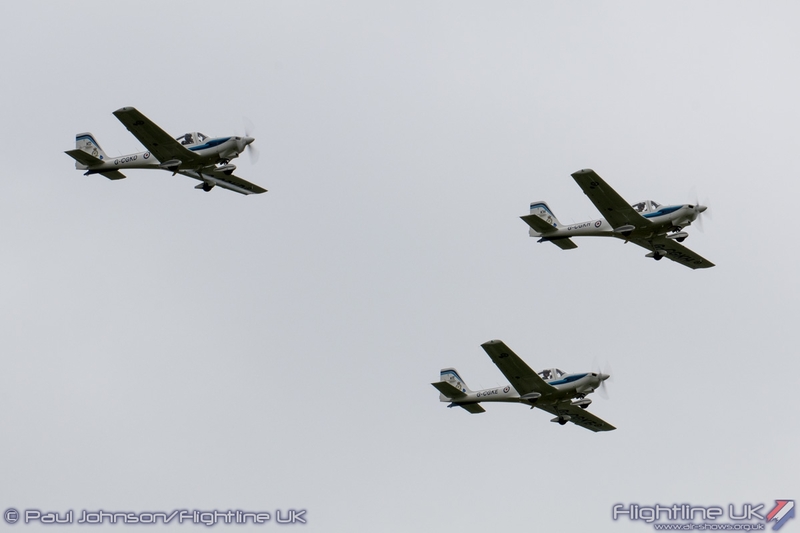 First off, a formation of three Grob Tutor T1s from the RAF Cosford based No 8 Air Experience Flight/University of Birmingham Air Squadron performed a flypast representing the current aircraft available for Air Cadet Experience flying. 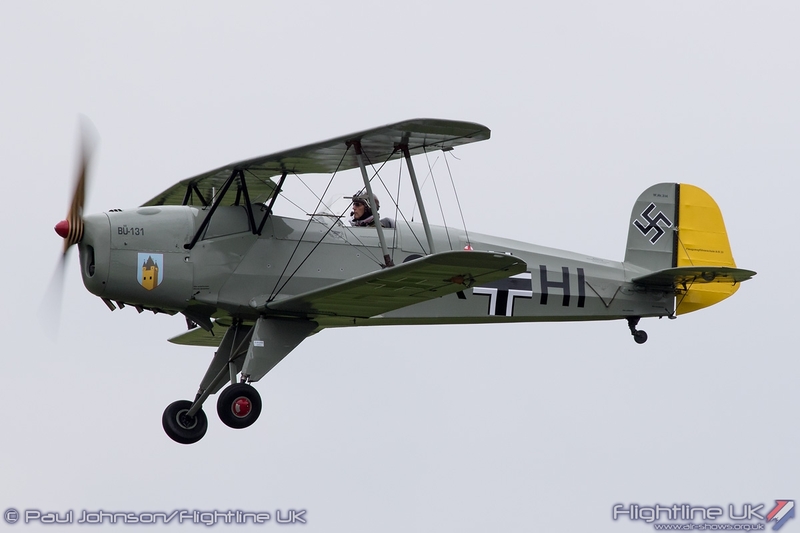 To add to the sense of occasion, each of the aircraft carried a staff cadet as a passenger. 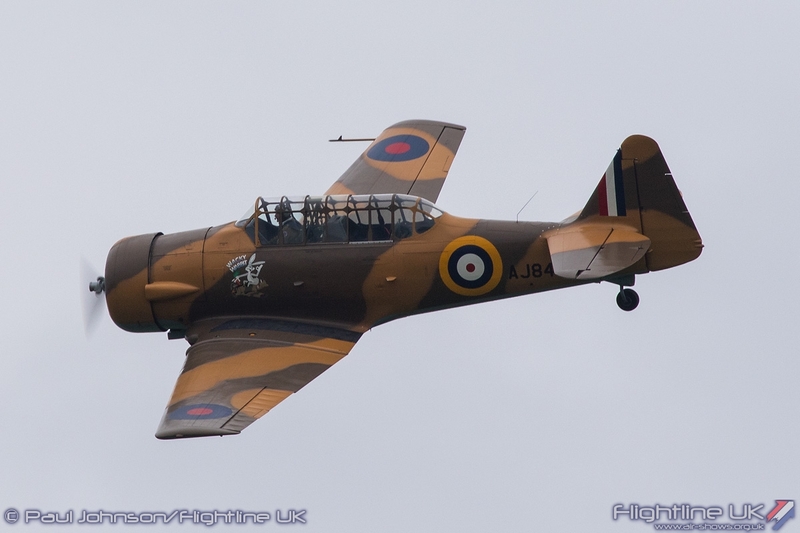 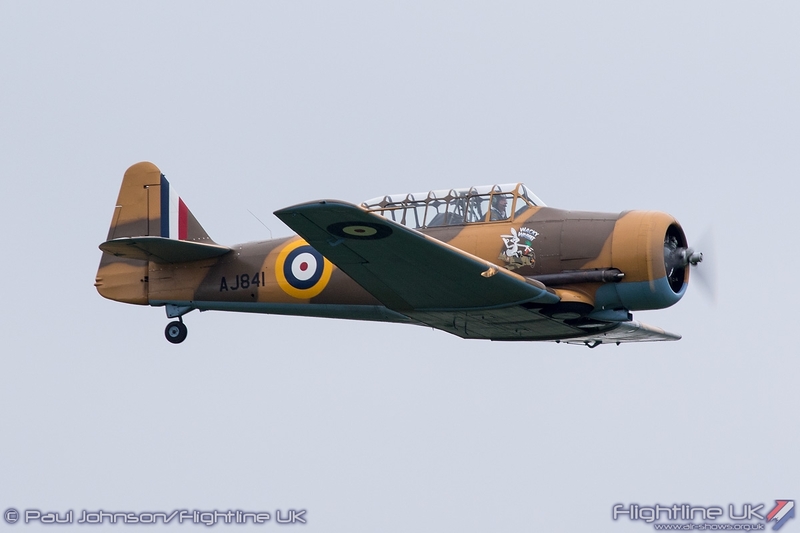 Later, a de Havilland Canada Chipmunk T10 wearing the markings of No. 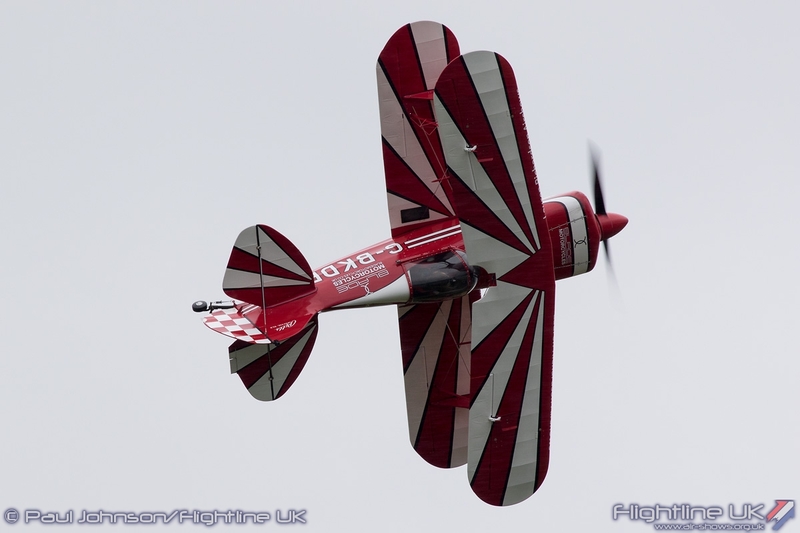 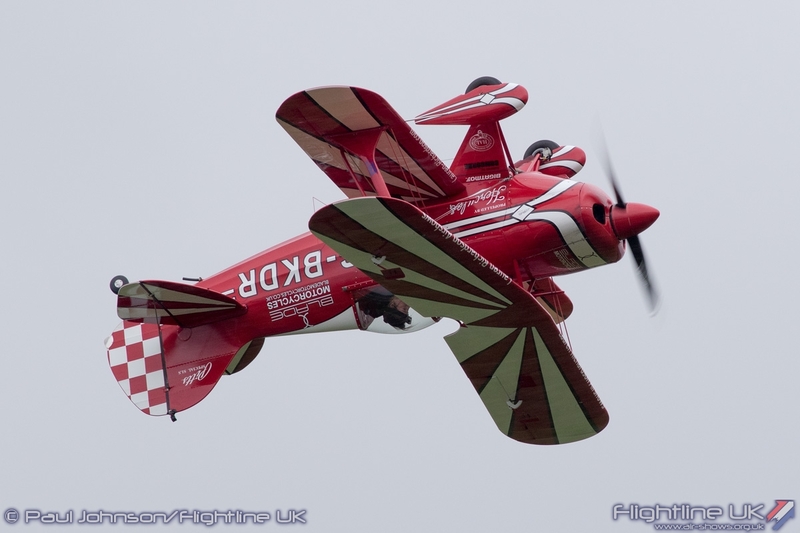 7 AEF flown by John Higgins put on an impressive aerobatic display. 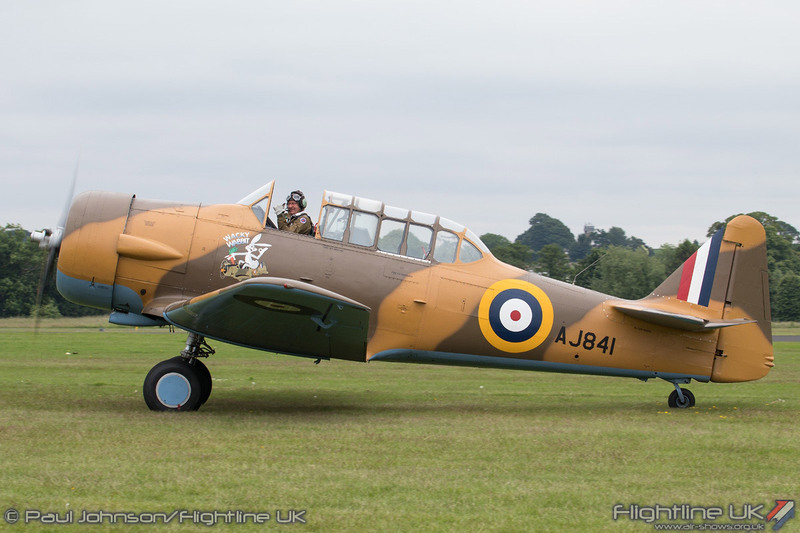 The Chipmunk was one of a number of historic training aircraft in the display. 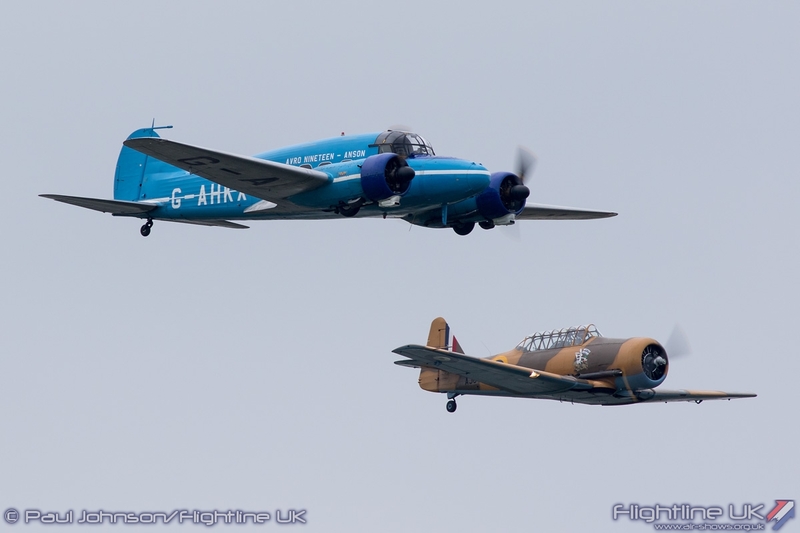 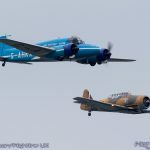 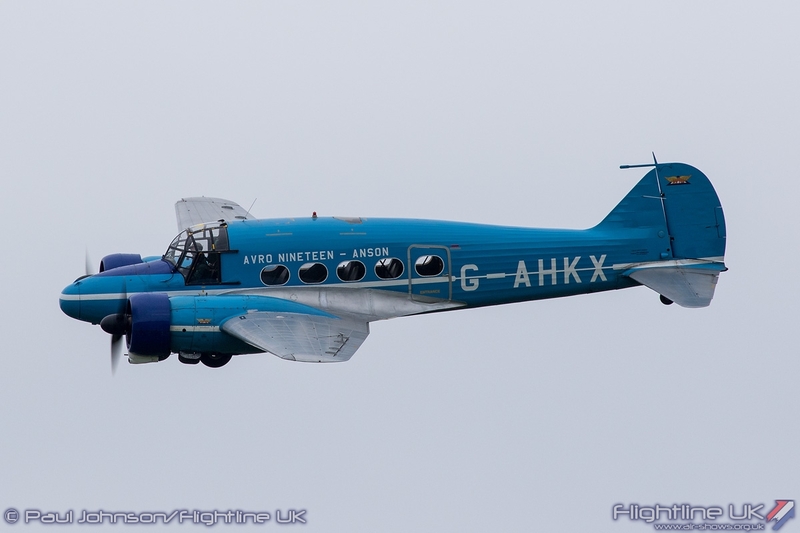 An unusual pairing saw BAE Systems’ Avro C19 Anson paired with the North American Harvard ‘Wacky Wabbit’ for some formation passes ahead on their solo routines. 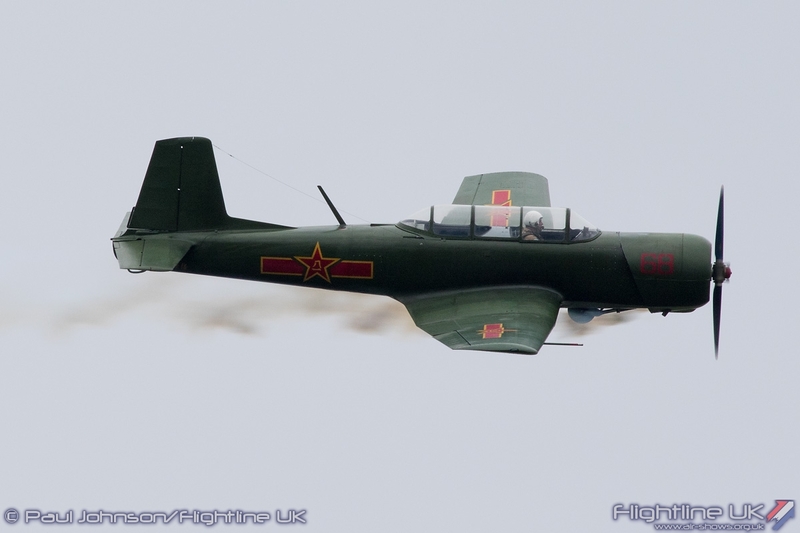 Another fine aerobatic performer was the Nanchang CJ-6. 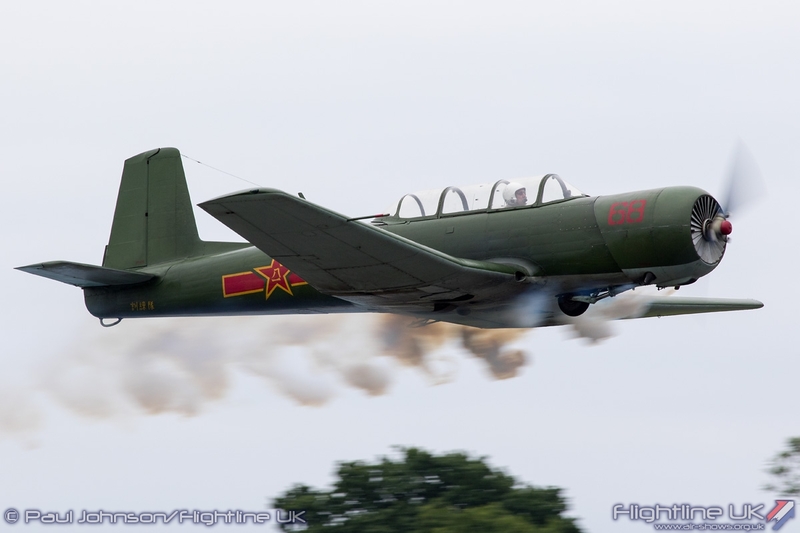 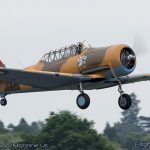 The CJ-6 was a training aircraft developed by the Chinese for the People’s Liberation Army Air Force. 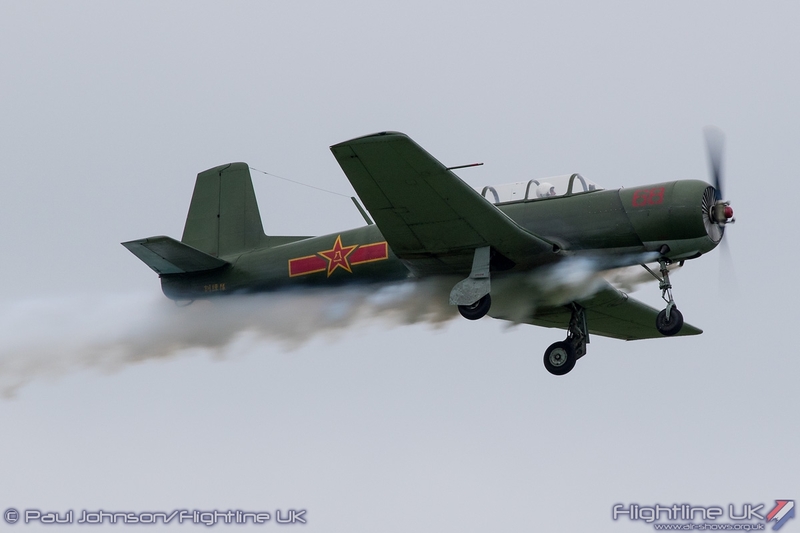 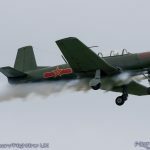 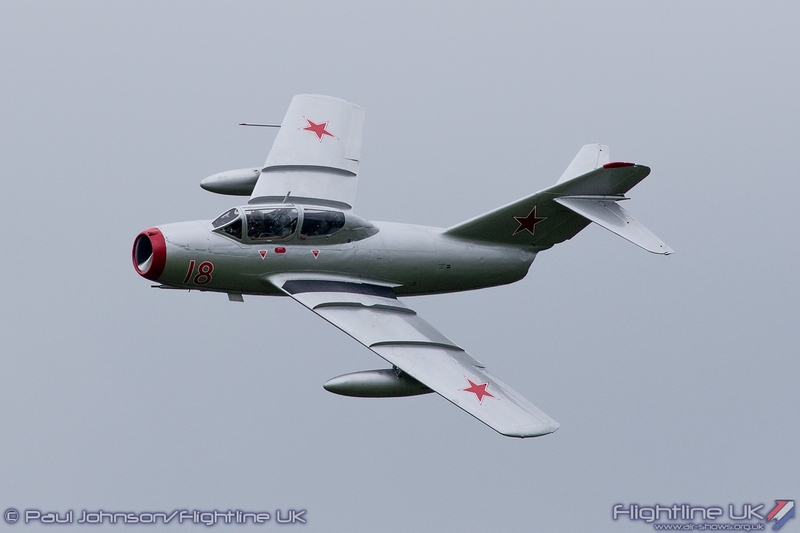 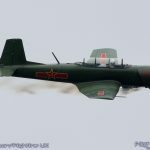 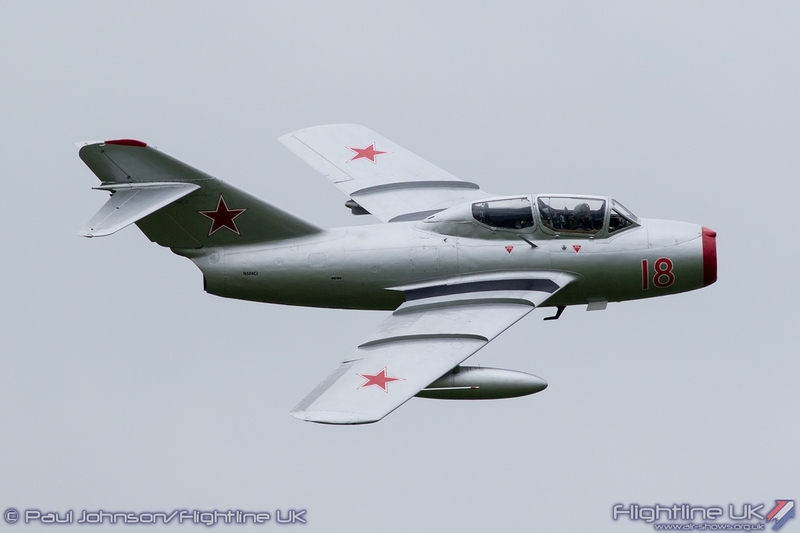 It shares heritage with the Yak-18 which was licence-produced by the Chinese as the CJ-5. 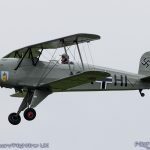 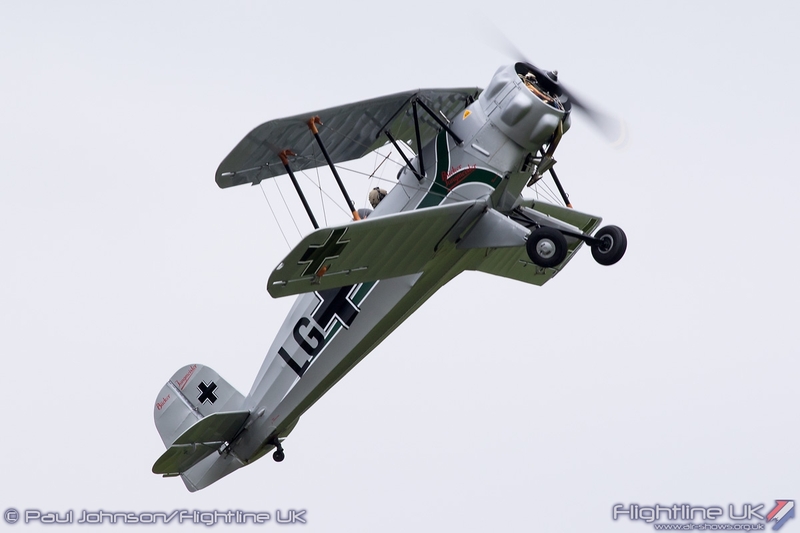 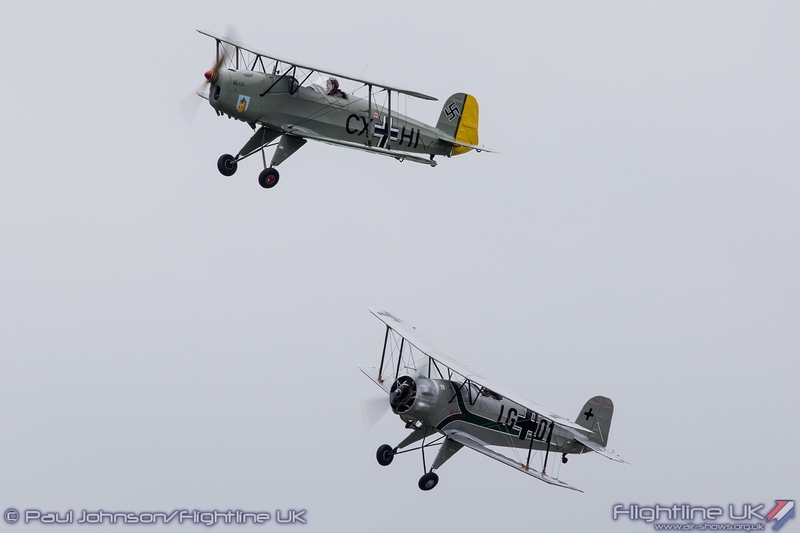 The Old Buckers returned to Cosford with a new formation of Bucker Jungmann and Bucker Jungmeister which both became popular training aircraft for the Luftwaffe both before and during the Second World War. 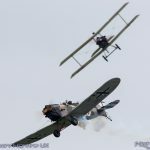 The Old Buckers present a gentle routine of formation flying, but did show a little of the Jungmeister’s aerobatic qualities which a novel stall-turn re-join following an opposition pass. 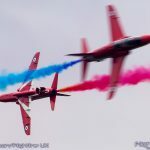 A big part of RAF Cosford Air Show revolves around the promotion of STEM – Science, Technology, Engineering and Maths. 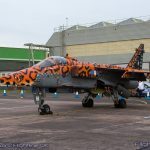 The centrepiece is a devoted hangar exhibition, but for the first time this year it was represented in the flying display. 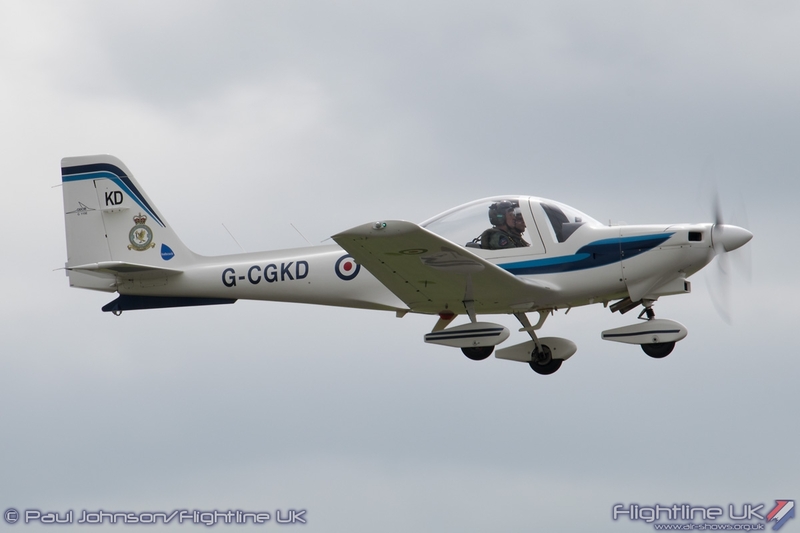 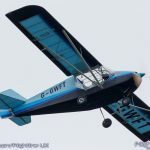 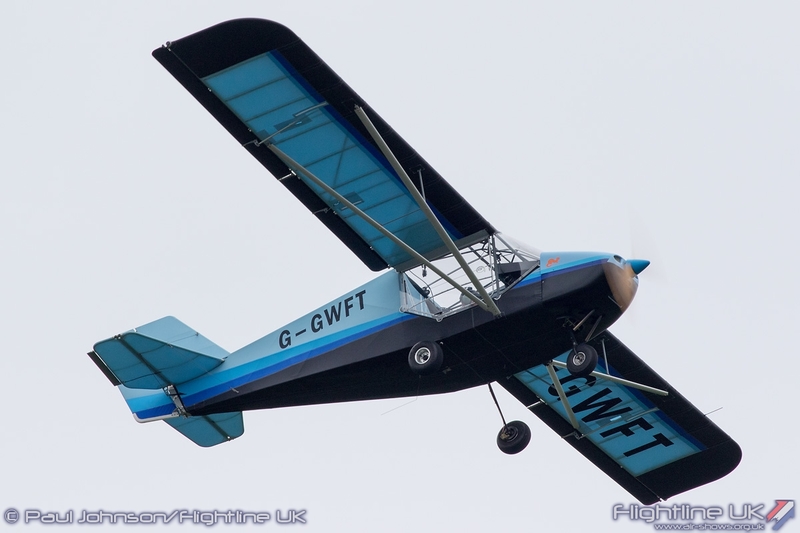 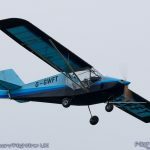 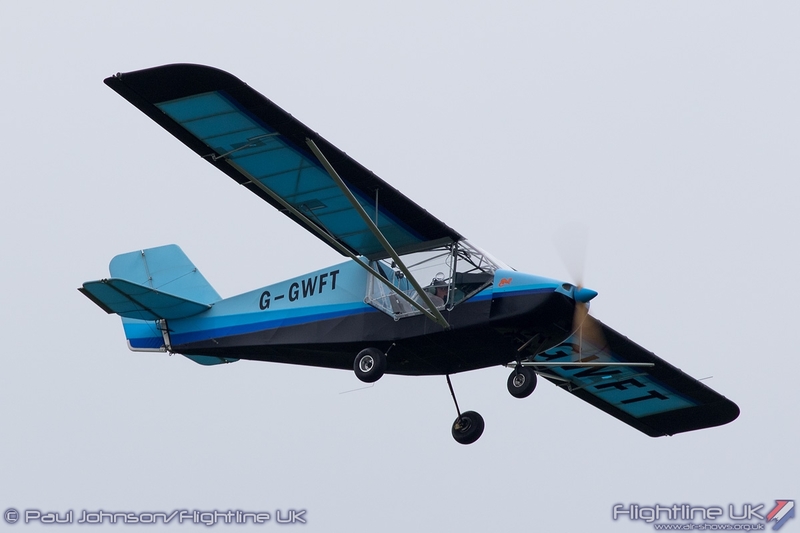 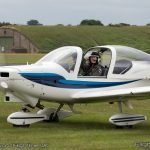 The Royal Aeronautical Society in recent years has sponsored the “Schools Build-a-Plane” project which has seen a number of schools work towards the build of a Rans S-6 Coyote II microlight aircraft. 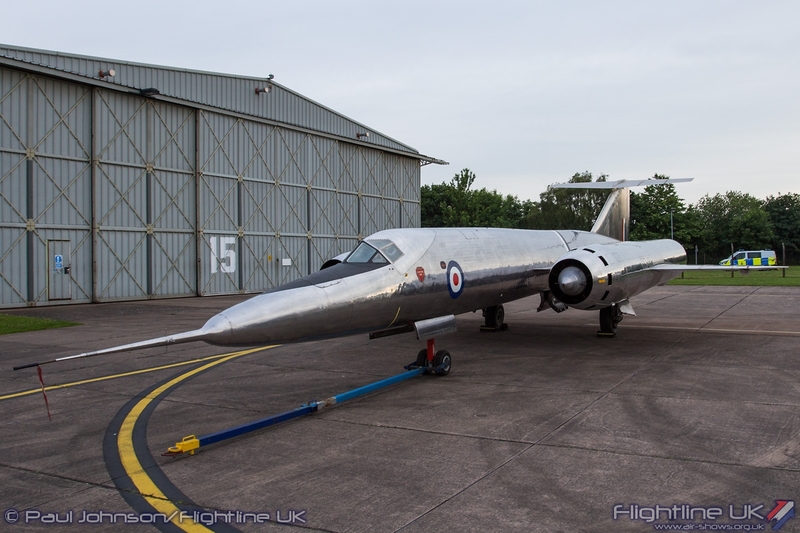 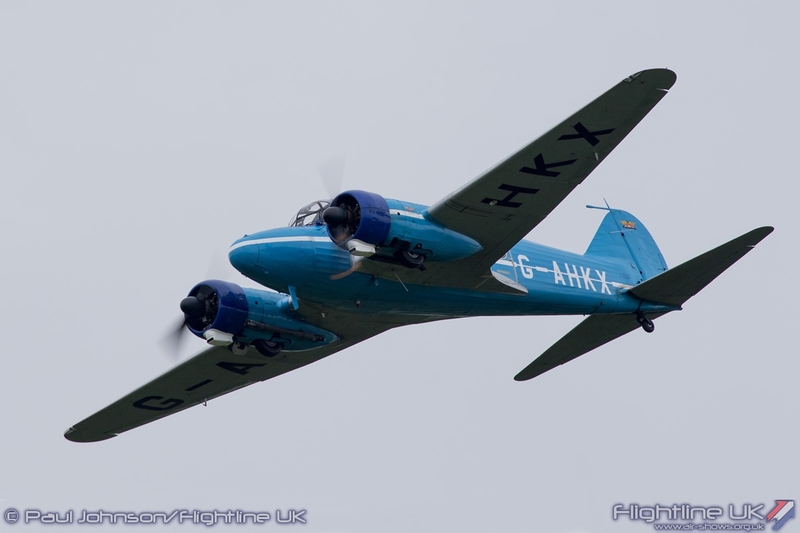 This very aircraft featured in the flying display to highlight the success of the project which promotes aviation and engineering. 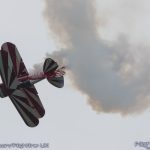 Lauren Richardson, who is an aviation engineer outside of display flying, also helped promote STEM during the late afternoon. 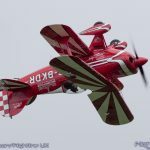 She gave a very punchy display in her beautiful Pitts S-1S Special ahead of visiting the STEM hangar to talk to visitors about aviation careers and flying the Pitts. 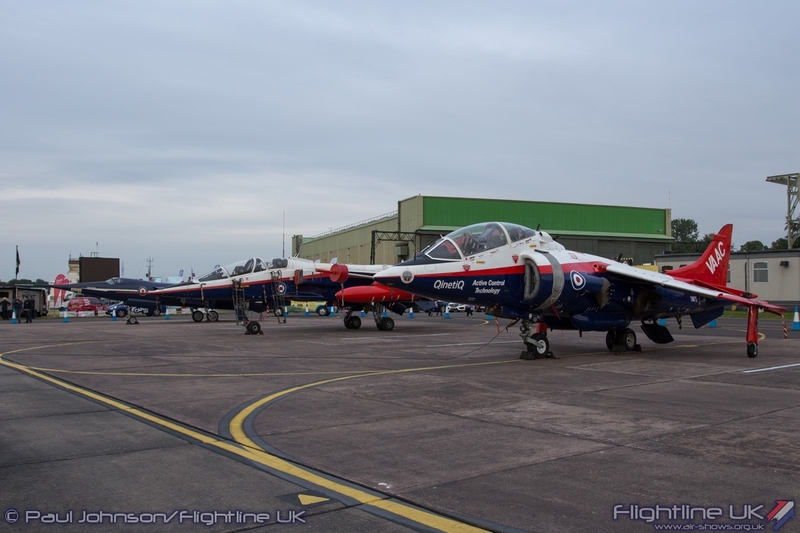 As mentioned earlier, some of the classic jets that had planned to take part cancelled due to the weather. 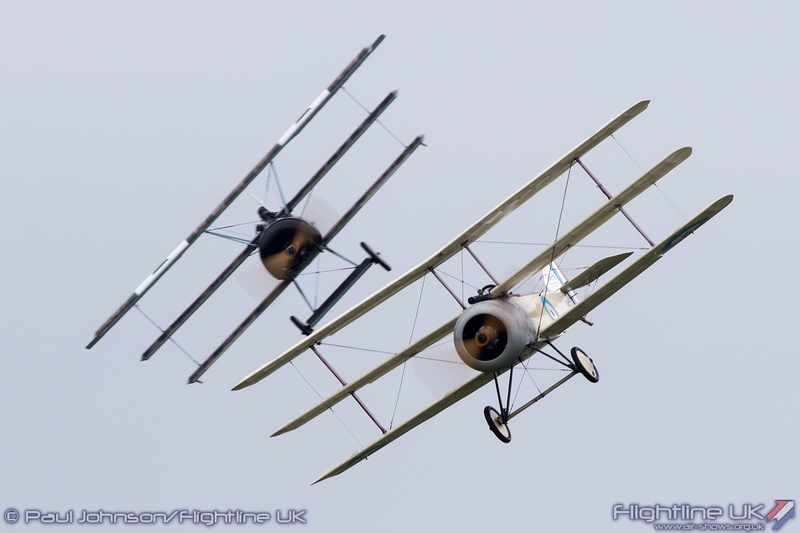 However, two did manage to fly that fitted into both the training and speed themes. 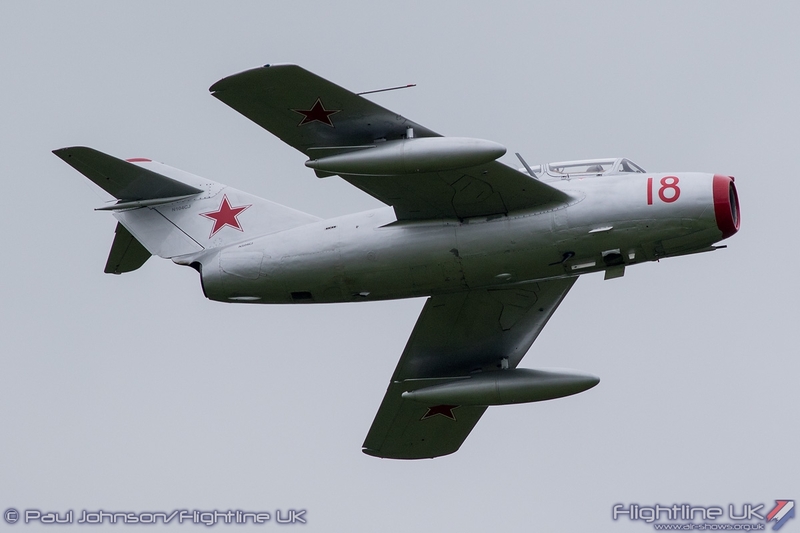 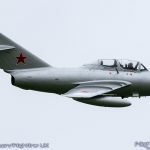 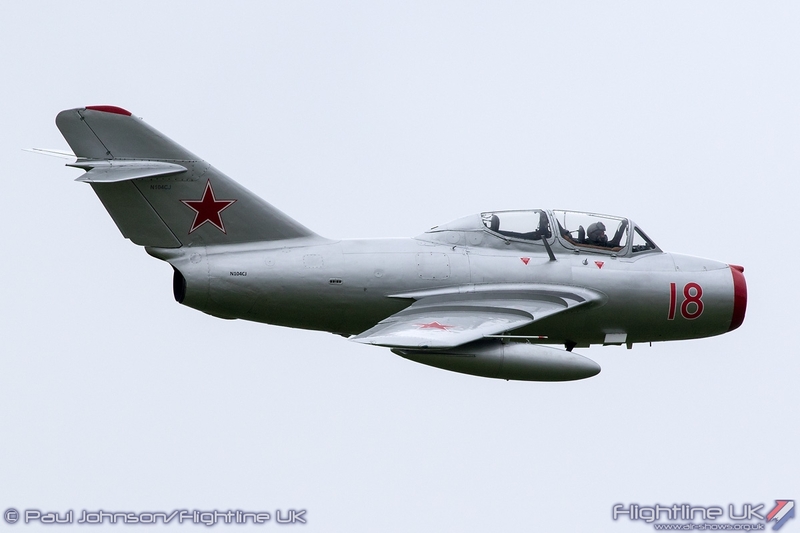 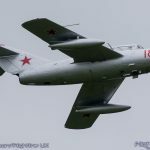 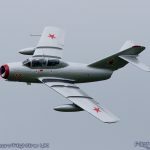 First to appear was the Norwegian Air Force Historical Squadron’s Mikoyan-Gurevich MiG-15UTi two seat training variant flown by Kenneth Aarkvisla which made some lovely sweeping passed during its display. 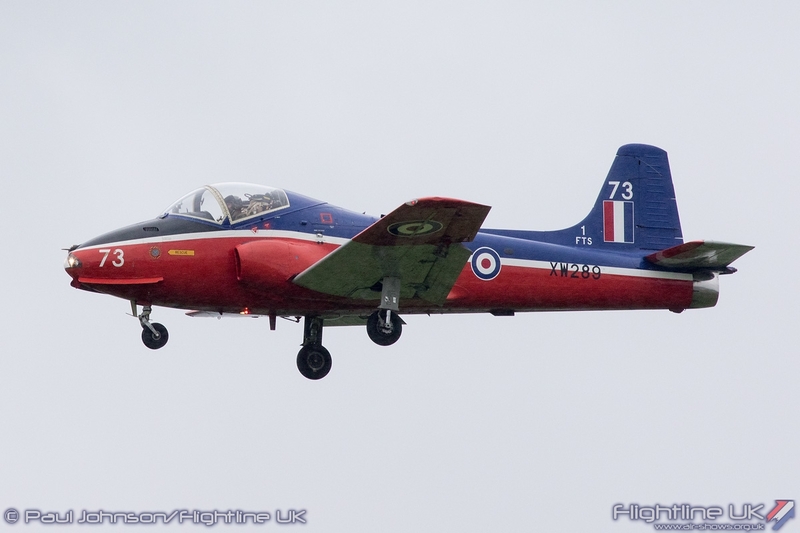 Later in the afternoon Ollie Suckling took to the skies as the rain started to fall displaying BAC Jet Provost T5 XW289 which was able to operate from Cosford’s short runway. 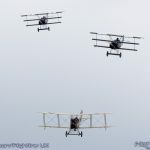 The 100th Anniversary of the Battle of the Somme was remembered by a fantastic display by the Great War Display Team. 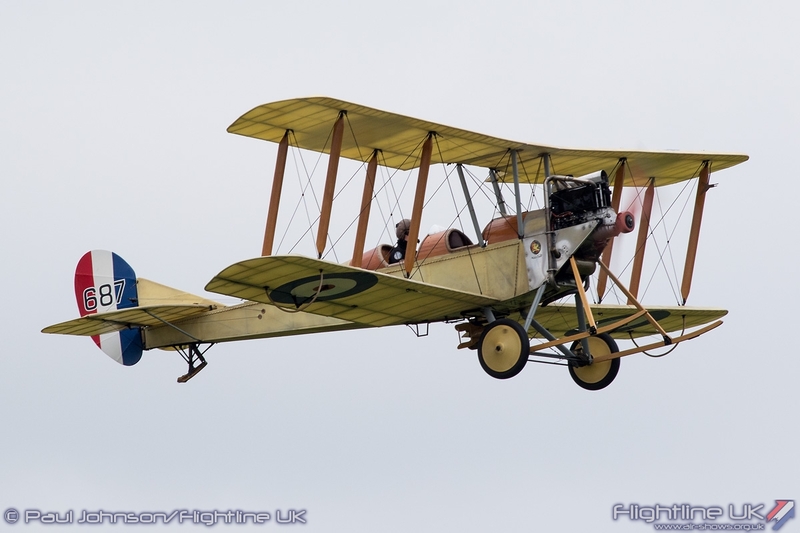 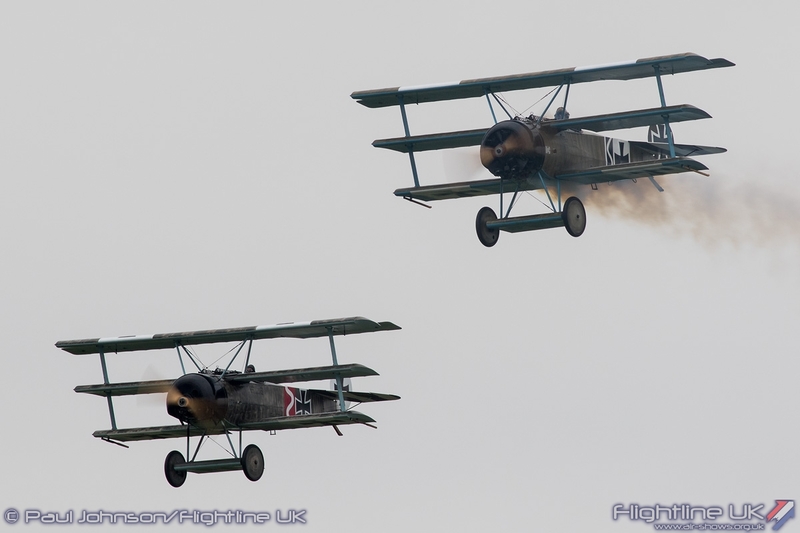 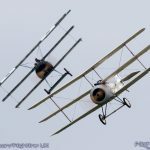 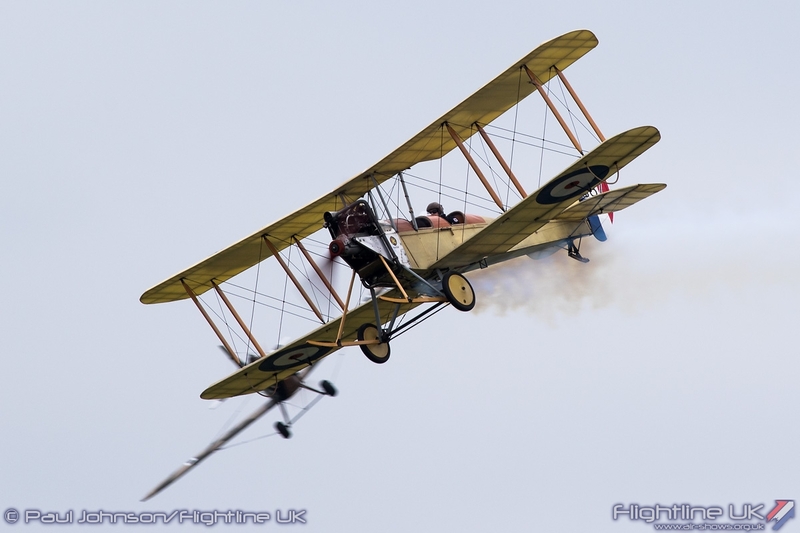 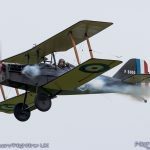 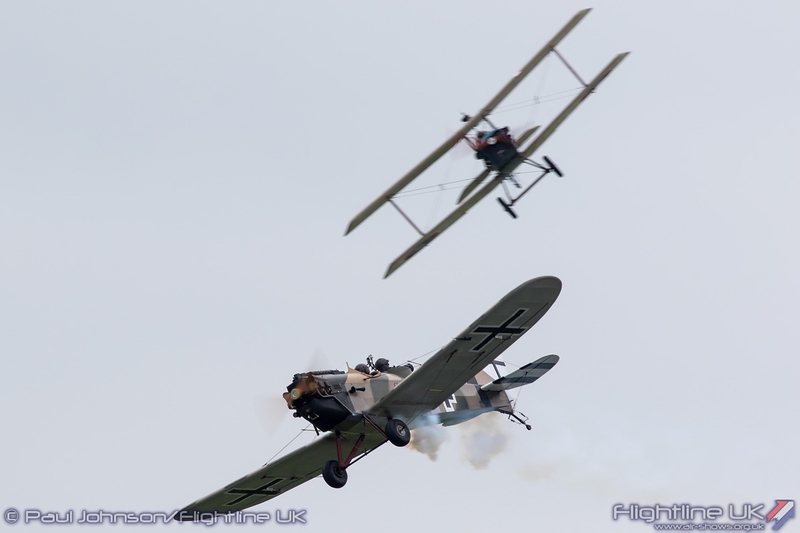 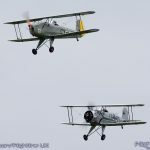 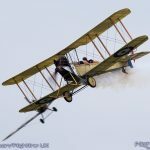 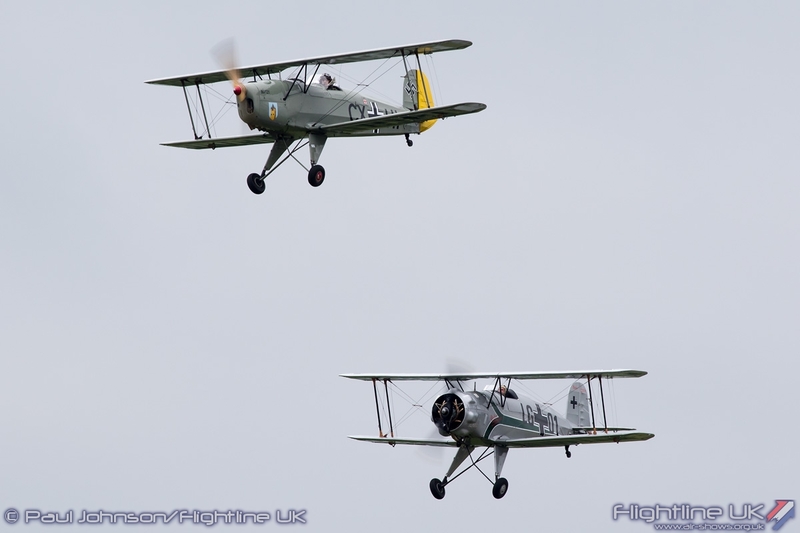 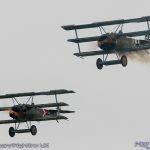 As ever the team recreated the swirling dogfights of the First World War with eight aircraft consisting of pairs of RAF SE5as, Fokker Dr1s and Junkers CL1s joined by the Sopwith Triplane and RAF BE2c. 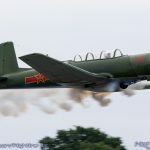 However for many of their displays this year, they have enhanced their display with some pyrotechnics recreating flak guns and bombs which creates a rally eye-catching re-enactment. 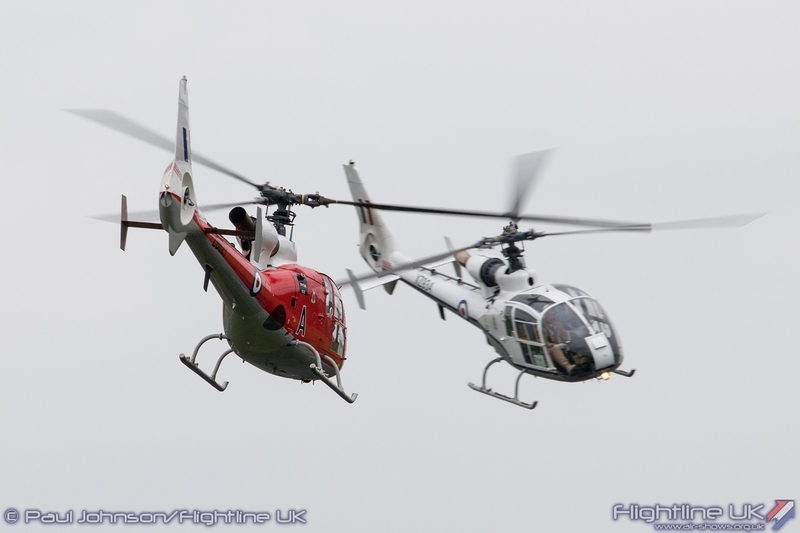 As the weather took a turn for the worse towards the end of the day, the final two displays of the afternoon also came from the helicopter world. 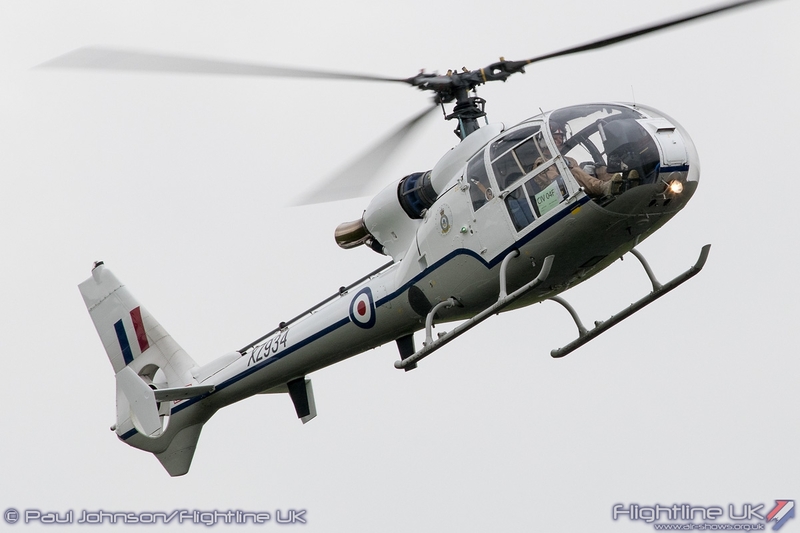 First up were the Gazelle Squadron making their public debut with a pair of their sleek Gazelle HT2 aircraft. 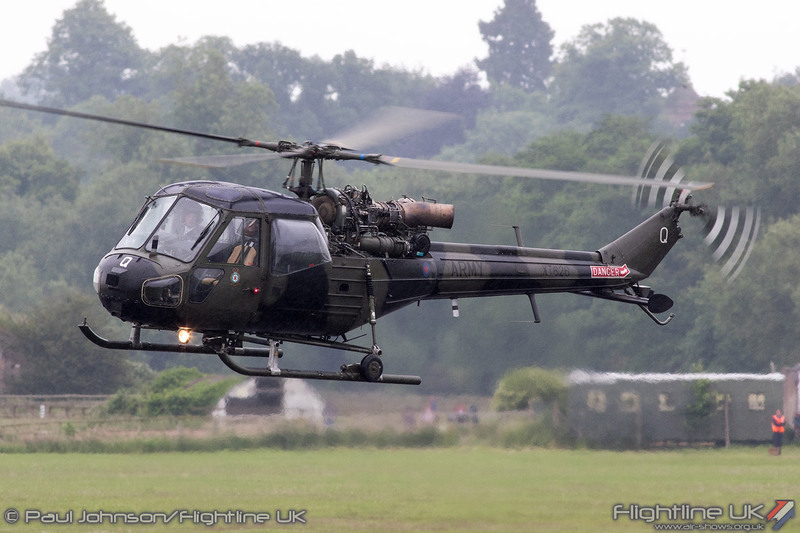 The Gazelle has a long history of display flying featured by the likes of the Royal Navy Sharks and “Pusser’s Pair” display teams and also the Army Air Corps’ “Blue Eagles.” The Gazelle Squadron’s display continues that fine tradition with a very nice and dynamic routine highlight the agility and speed of the aircraft. 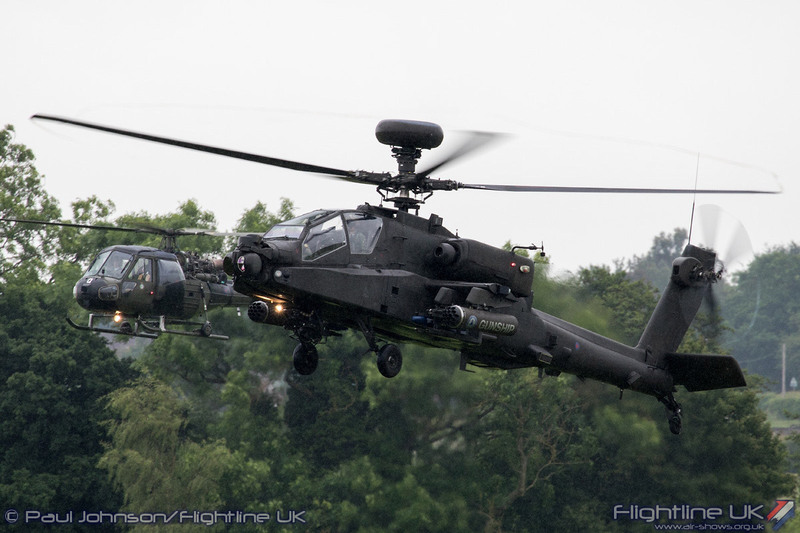 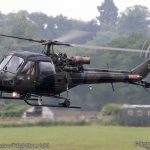 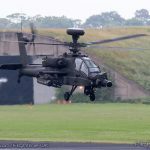 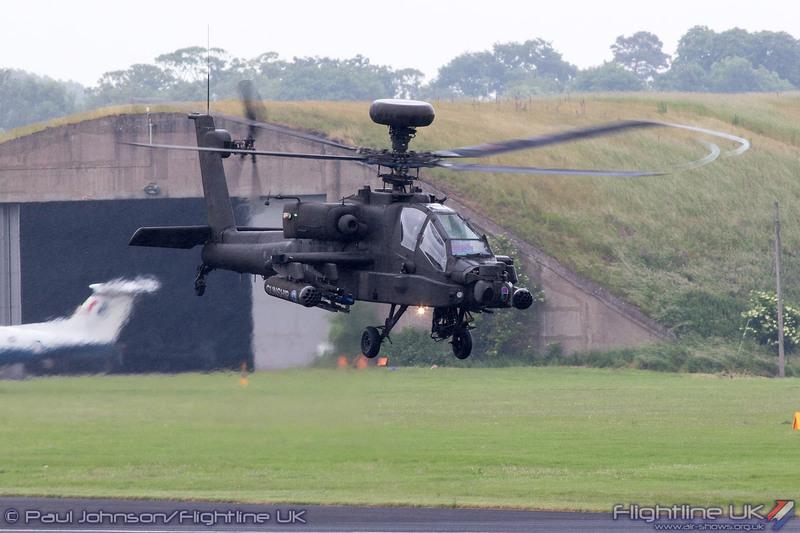 The modern day Army Air Corps celebrated its heritage bringing together attack helicopters old and new. 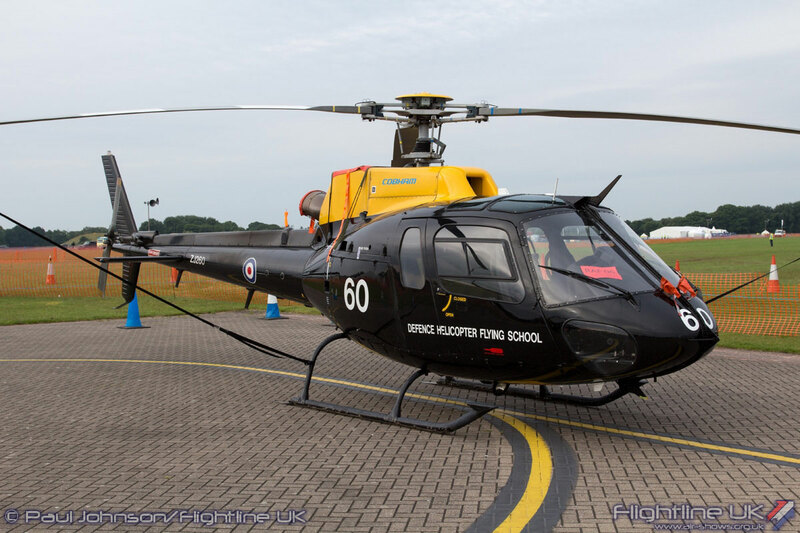 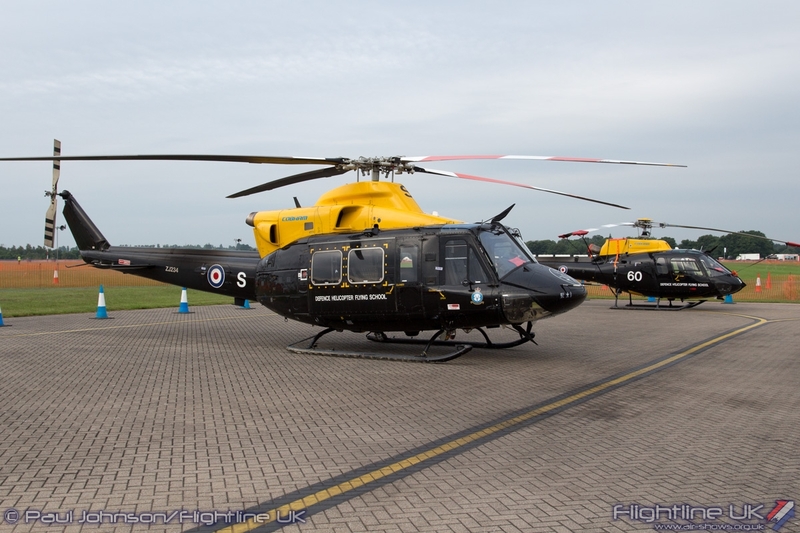 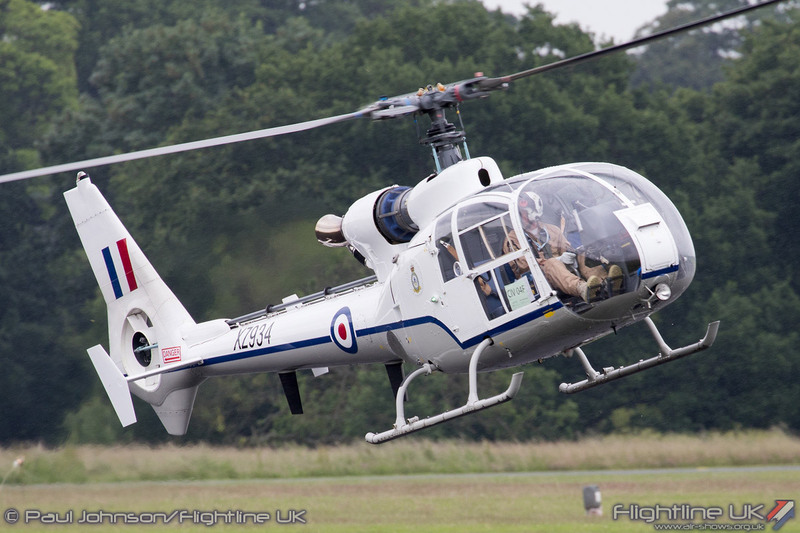 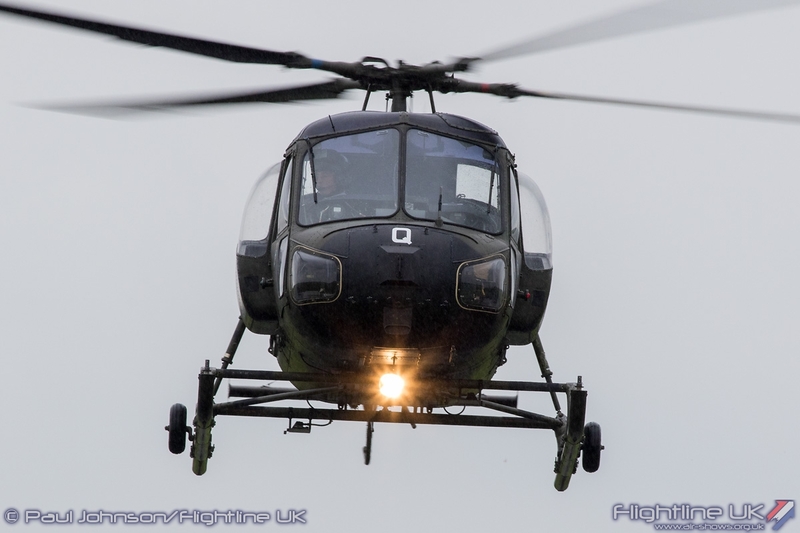 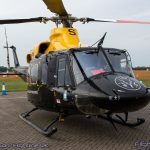 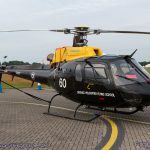 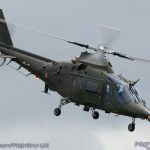 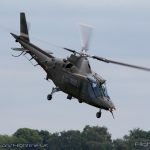 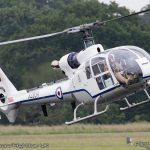 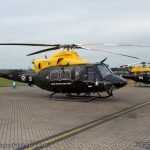 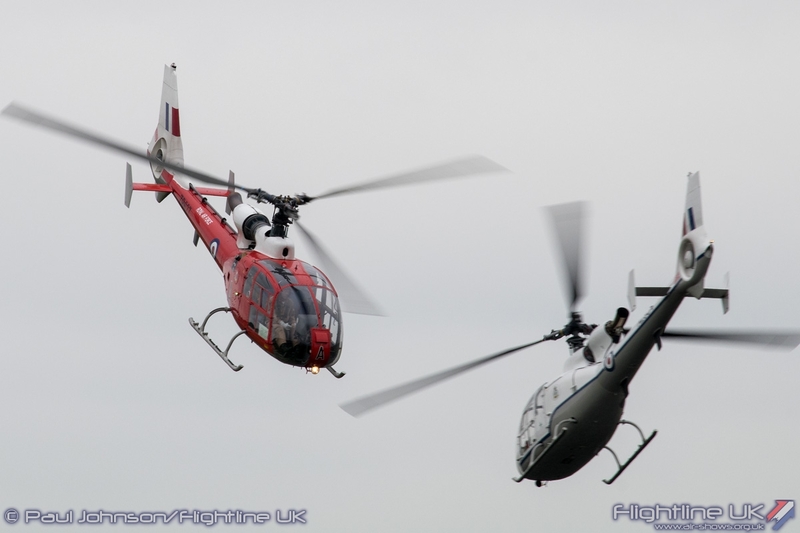 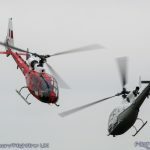 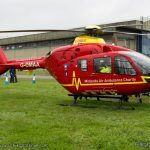 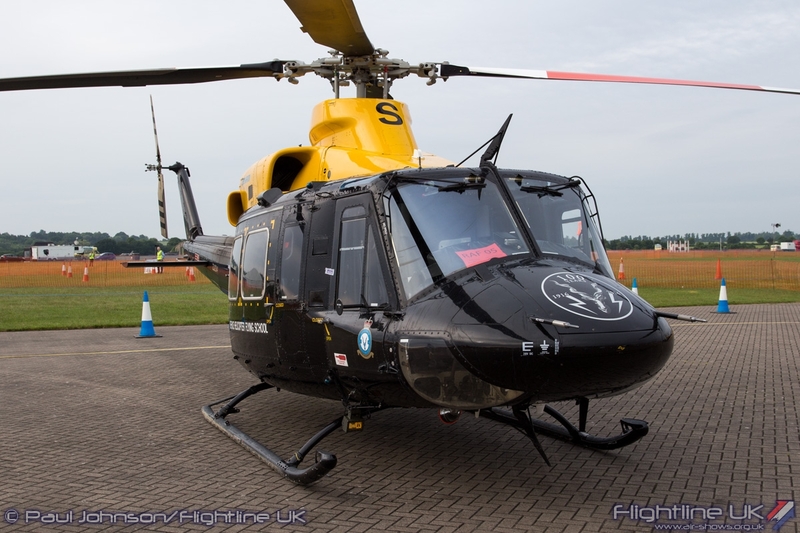 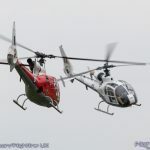 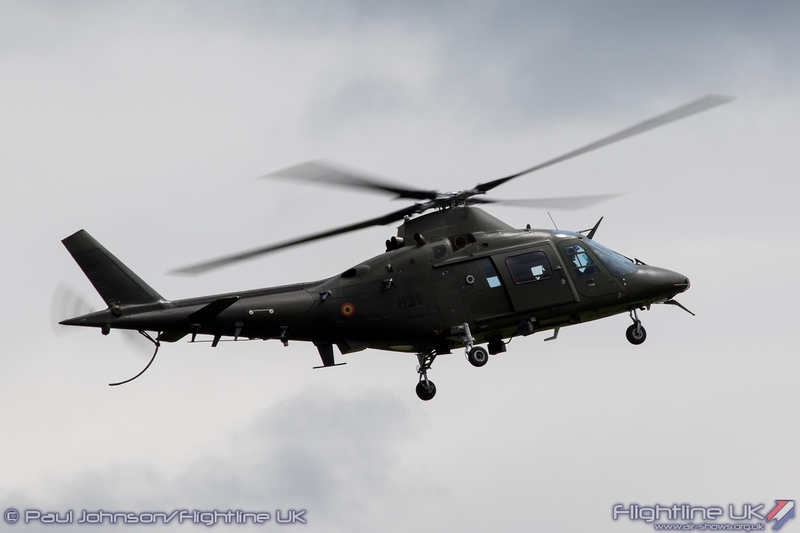 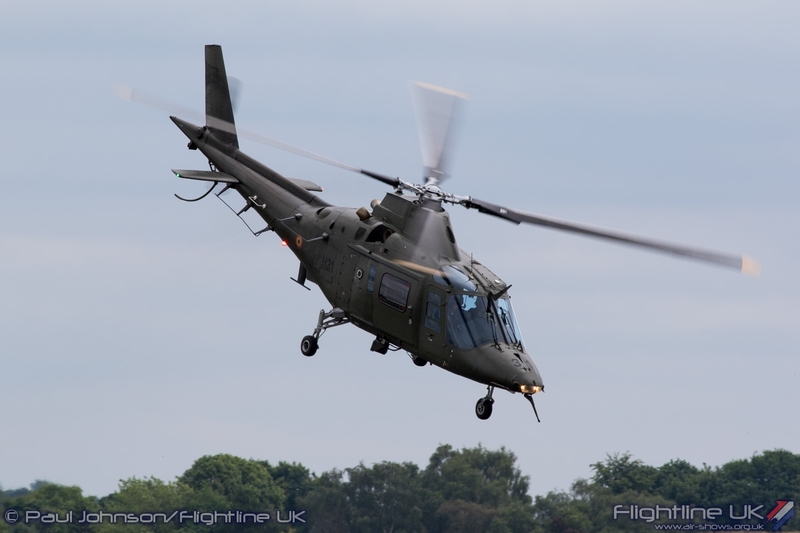 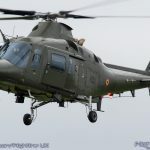 Sadly, the Historic Aircraft Flight’s Agusta/Bell Sioux AH1 went unserviceable but their Westland Scout AH1 did fly alongside the AgustaWestland WAH-64D Apache AH1 for a circuit and hover at crowd centre before performing their respective solo displays. 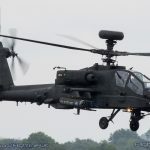 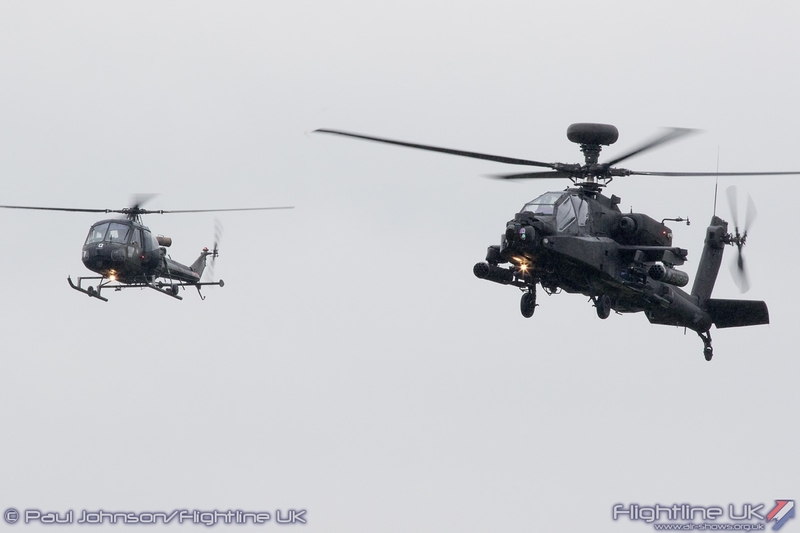 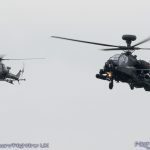 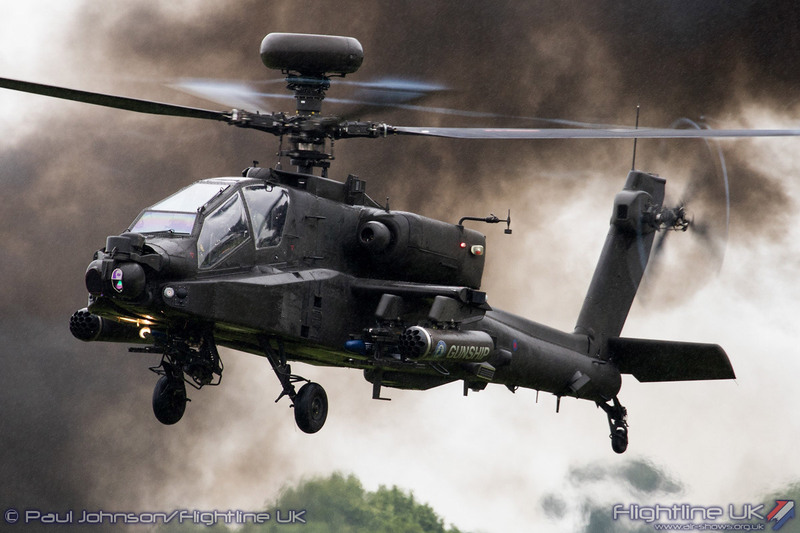 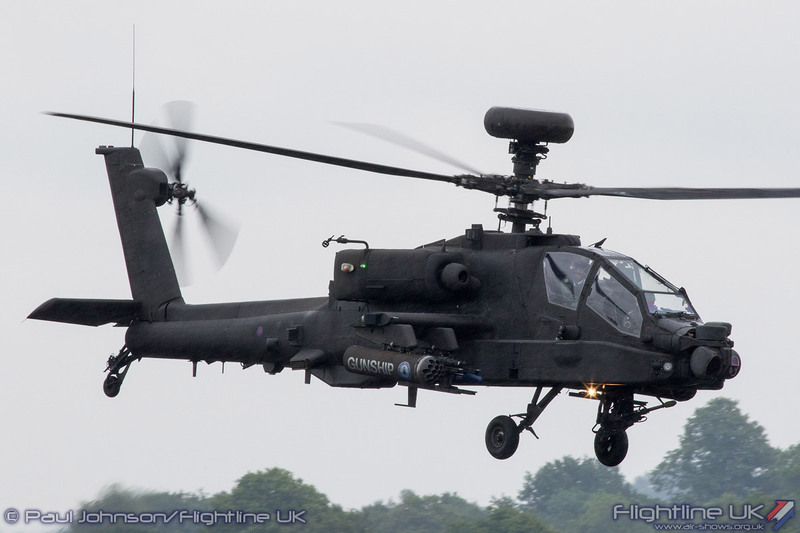 The Apache was particularly impressive putting a seriously explosive role demonstration despite the now persistent drizzle that enveloped Cosford. 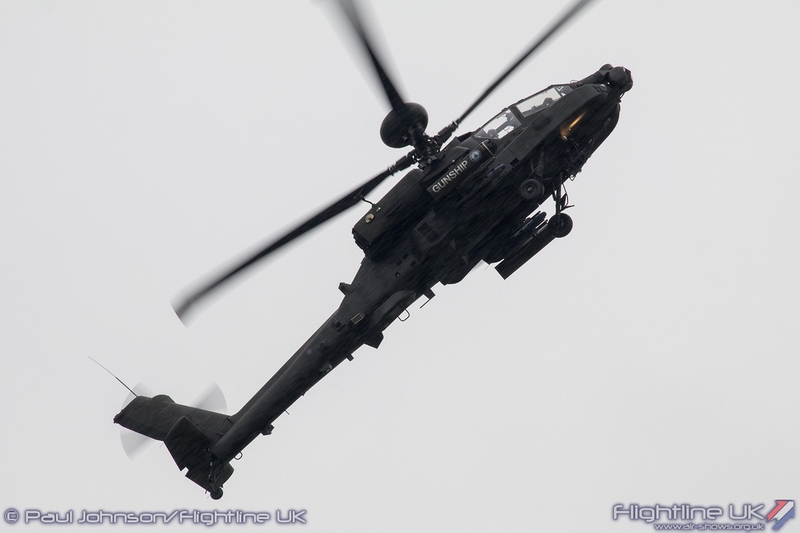 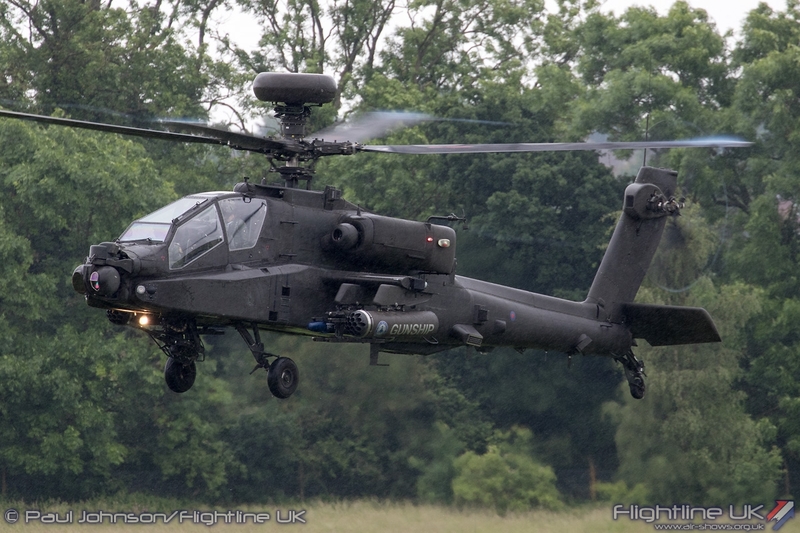 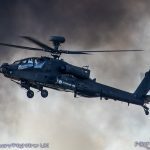 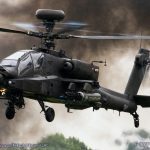 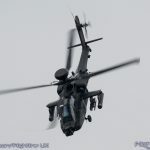 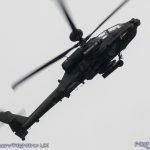 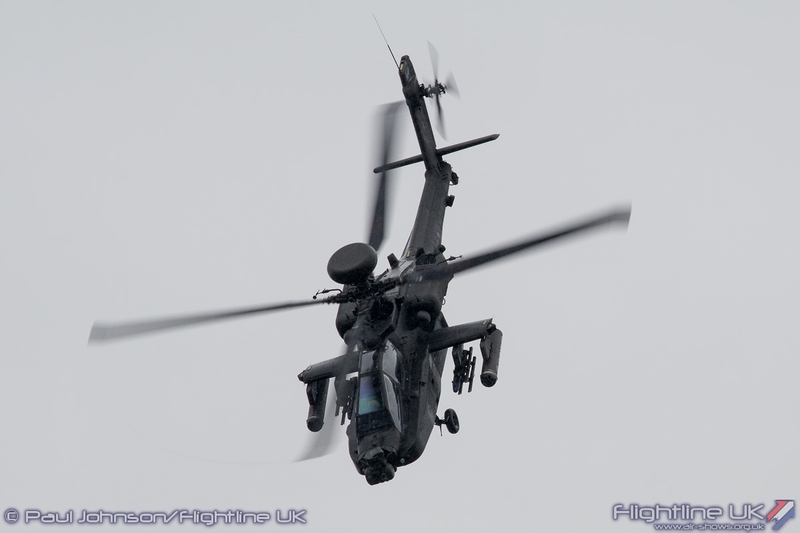 Sadly, the Apache proved to be the last ‘visible’ display of the afternoon. 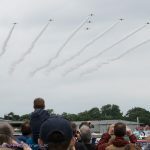 The United States Air Force B-52H Stratofortress did make it to Cosford, but we only heard it as the cloud base dropped below the 1000ft minimum required by USAF. 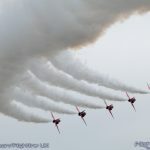 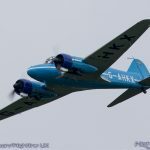 The show was dealt rather a poor hand by the weather which took the edge off the flying display through the various cancellations. 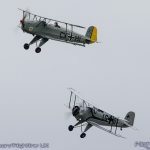 However, what did fly did provide an interesting, varied and above all entertaining afternoon despite the grey gloom. 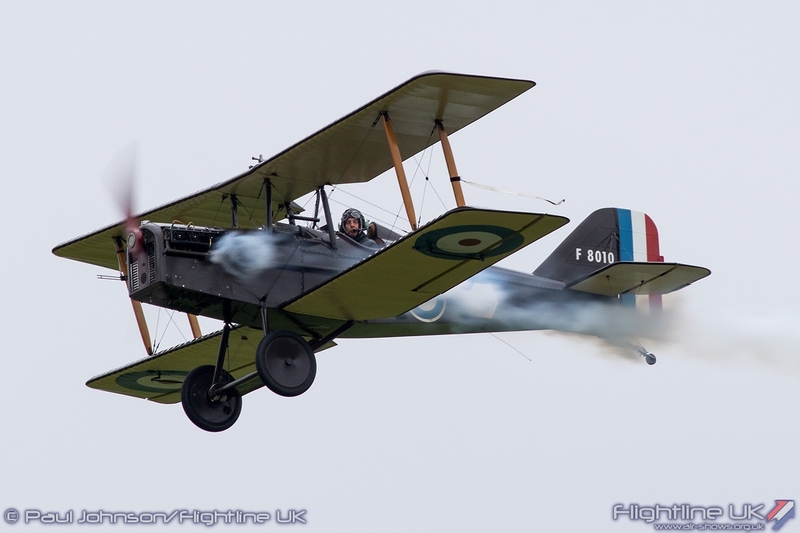 Particular congratulations should go to the Great War Display Team who picked up the Bill Hartree Award for best overall flying display. 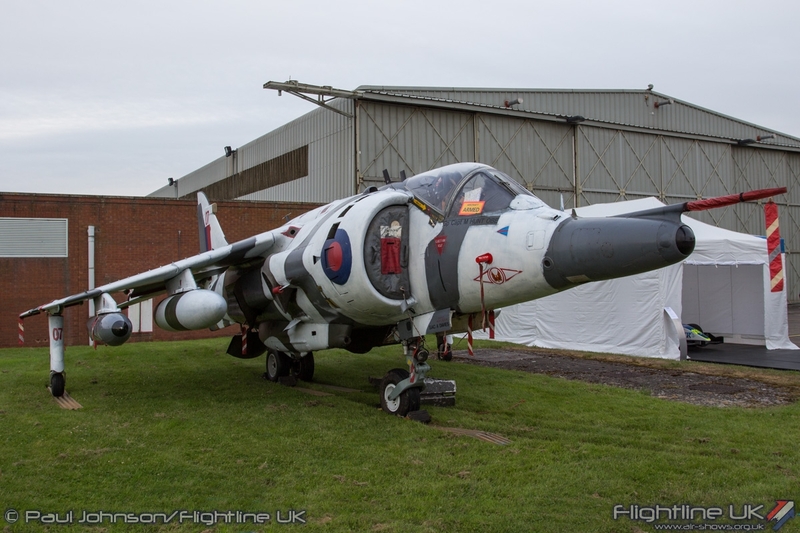 Special mention should also be made of the excellent hangar exhibitions which are often overlooked and are every bit as important as the flying for showing off the world of the Royal Air Force and the wider aviation world. 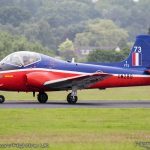 RAF Cosford Air Show returns in 2017 on 11th June and we look forward to it.